Disclosure: This post may contain affiliate links. I was provided product from Plaid to complete a project for this contest. All opinions are 100% my own. 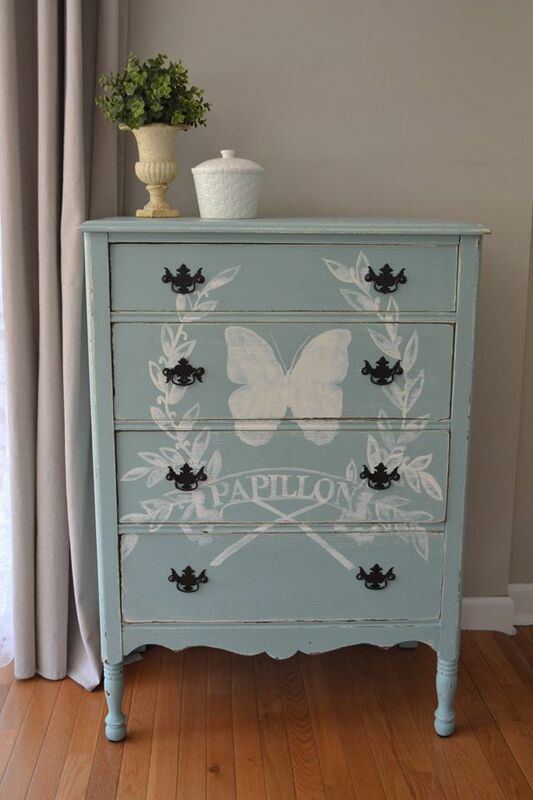 This May was Mod Podge’s 50th anniversary and to celebrate the Fab Furniture Flippin Contest sponsor was Mod Podge!! Oh man do I love Mod Podge!! I use this stuff on so many projects of mine! 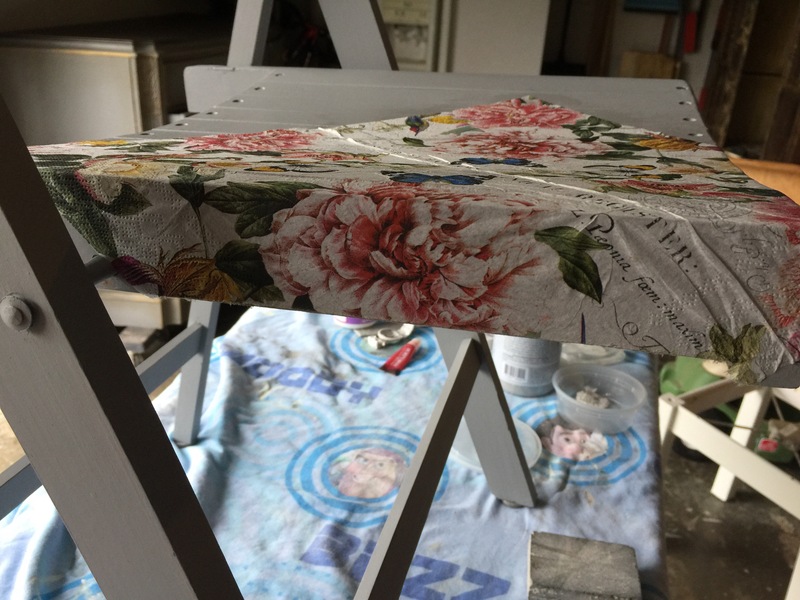 From decoupaging fabric and paper to transferring images on ceramic, wood and more! 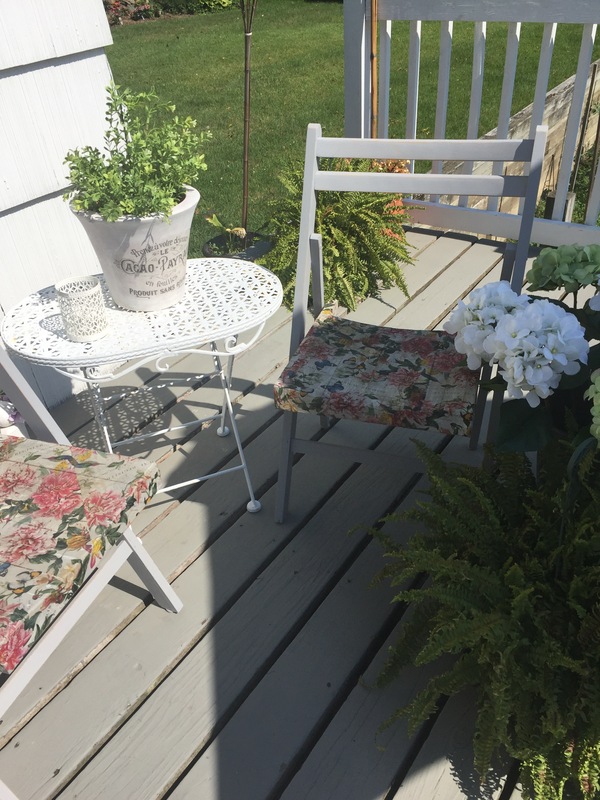 This month’s theme is “Garden Treasures”. 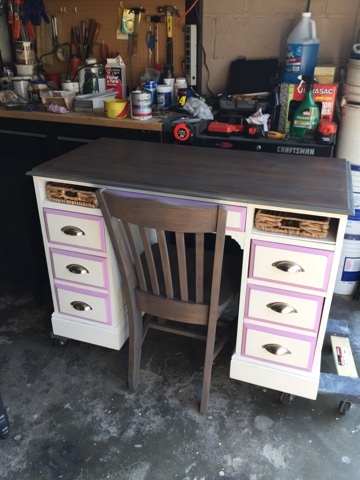 I received 2 different types of Mod Podge to complete this project. 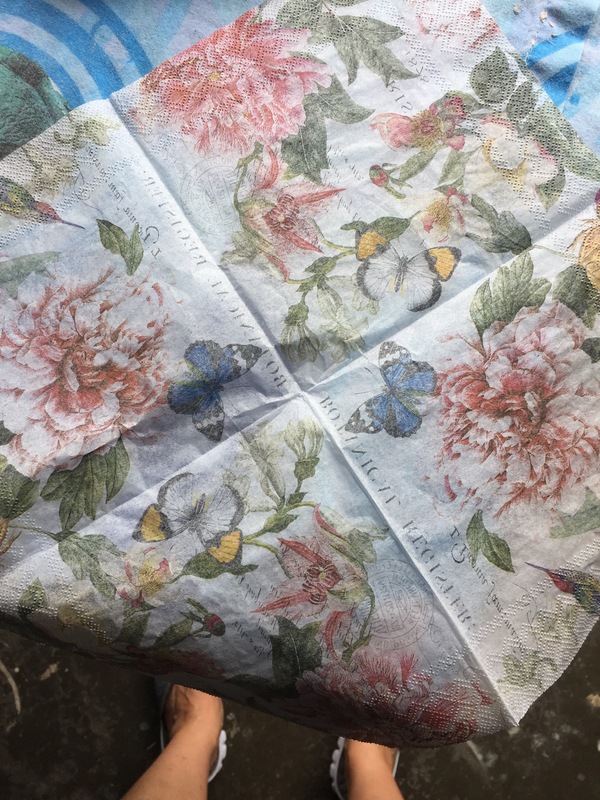 One was a type meant for fabric or paper decoupage and the other was a hard coat meant to be used as a sealant. 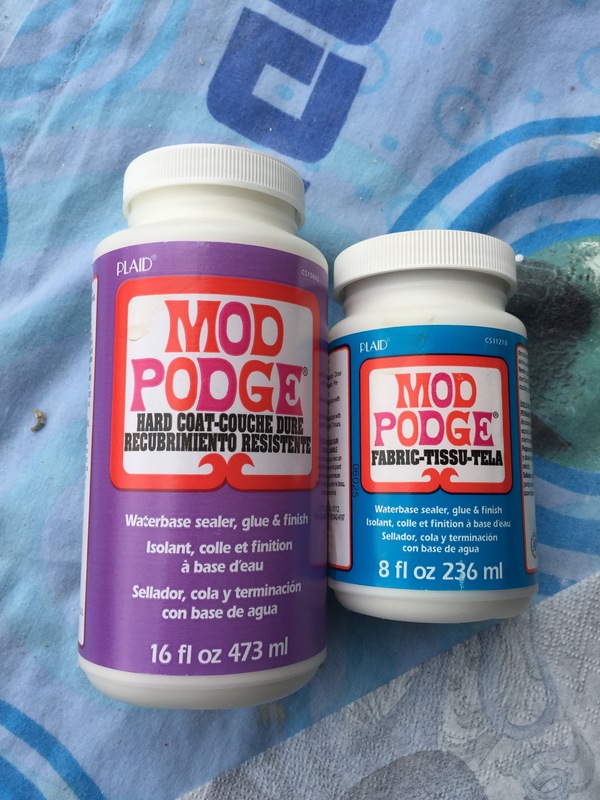 Who knew there were so many types of Mod Podge?? I didn’t! I had a tough time trying to decide what to makeover for this month’s contest. 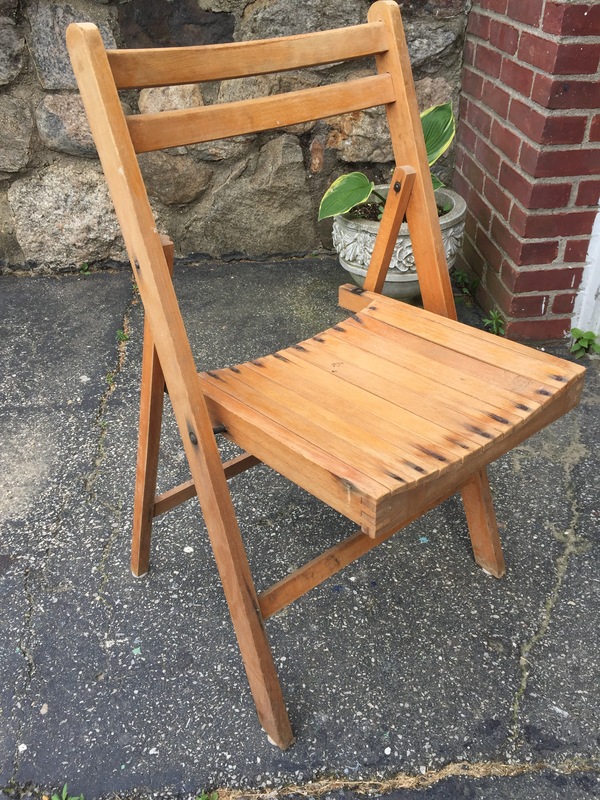 I finally decided to work on these 2 folding chairs I had found on the curb a couple of years ago. They were sitting in my shed just begging for an update! 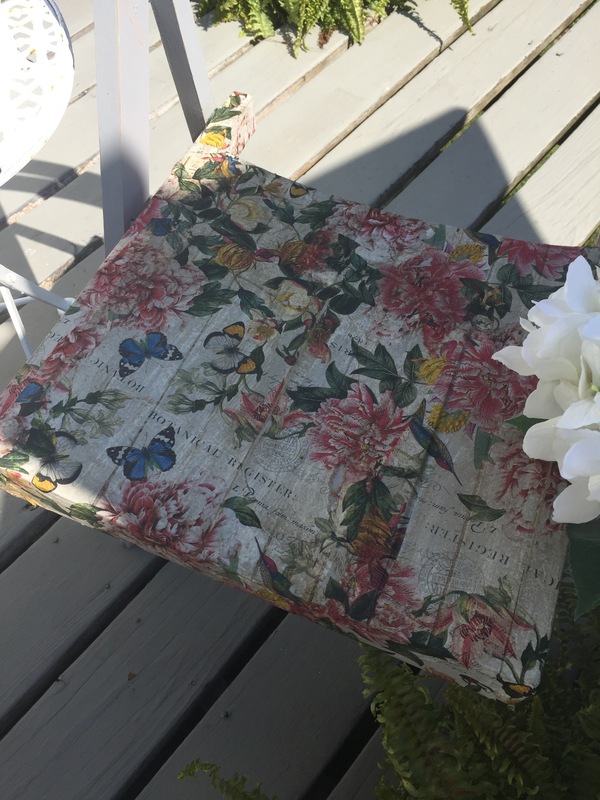 I thought these would be adorable with a little update of paint and decorative napkins decoupage on them! 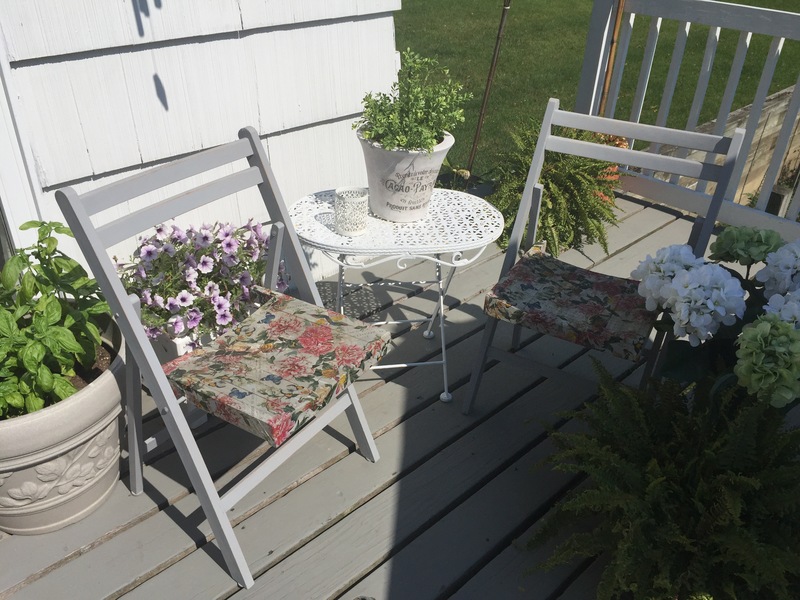 I could use them as extra seating on my deck! First I cleaned them really well and used some paint I had leftover from another project I recently completed. 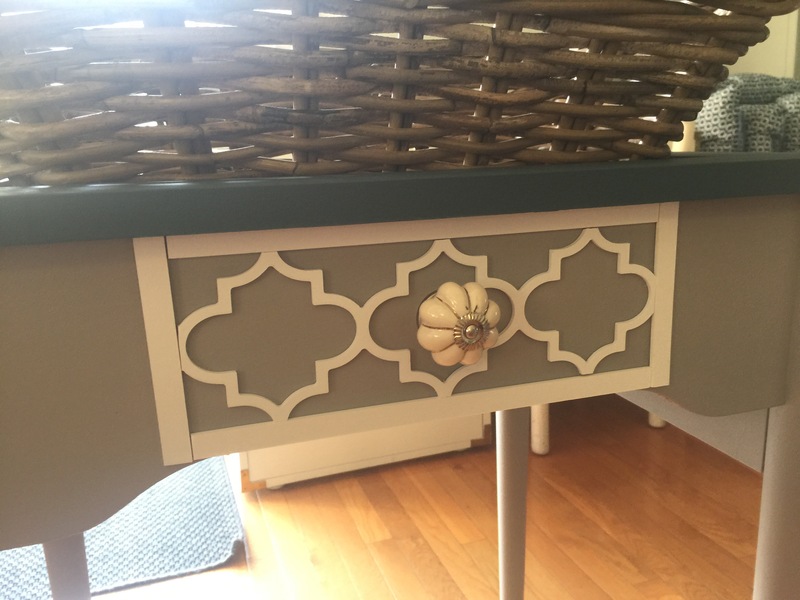 I used Heirloom Traditions Paint in Cobblestone which is a light blueish gray. Here they are! They look better already but they’re going to look even better with some Mod Podge decoupage! 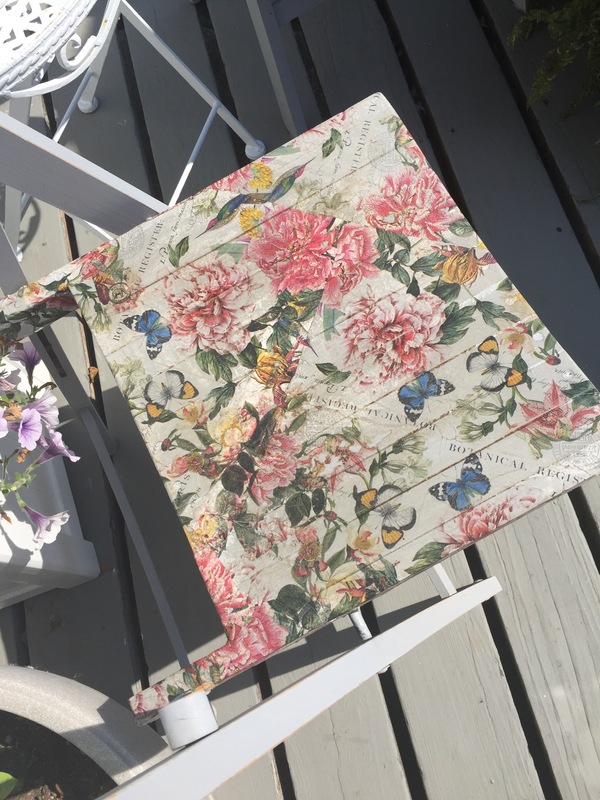 I decided to decoupage pretty decorative napkins on the seats of the chairs. 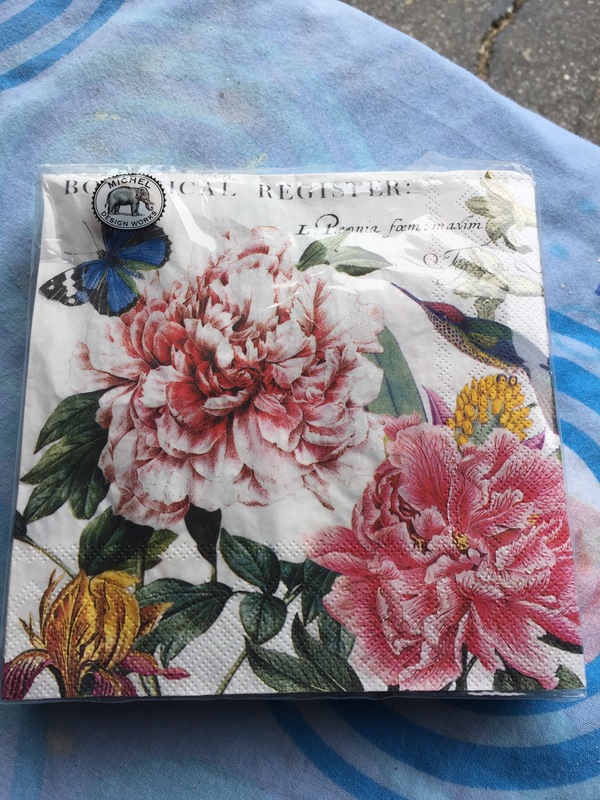 I bought these pretty napkins on Amazon. They are 3 ply napkins. 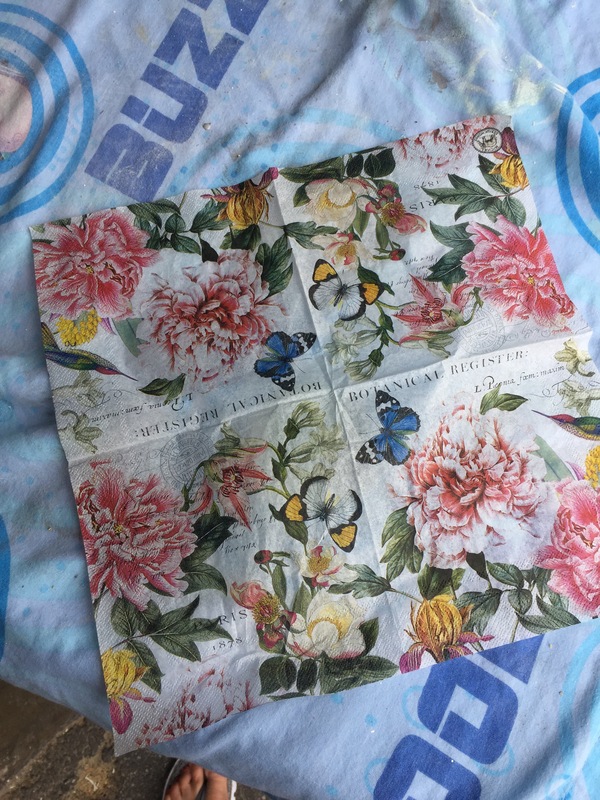 This is the underside of the napkin. 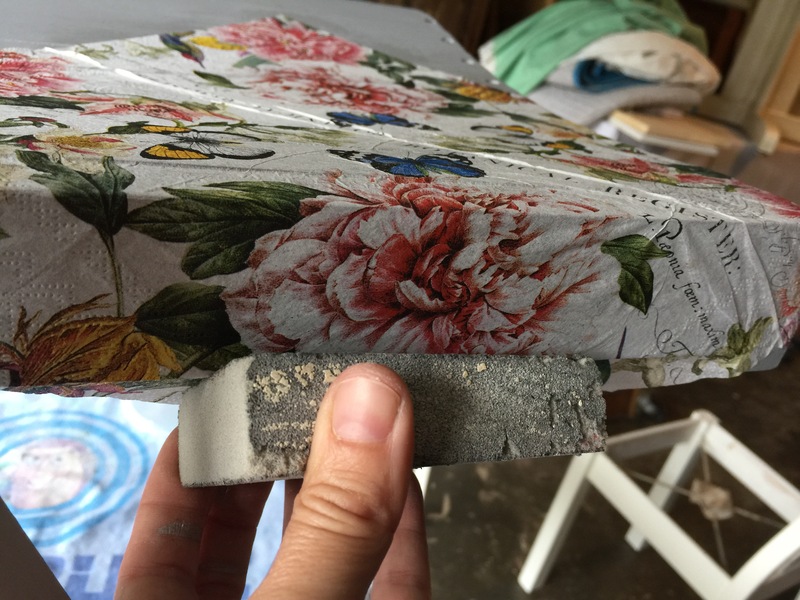 Because they are 3 ply you need to remove the 2 other layers and only decoupage the top layer. When you peel back at the edge, you will see the 2 layers and you’ll just peel them slowly off. Now you’re left with one layer. The top. Here is the top layer. 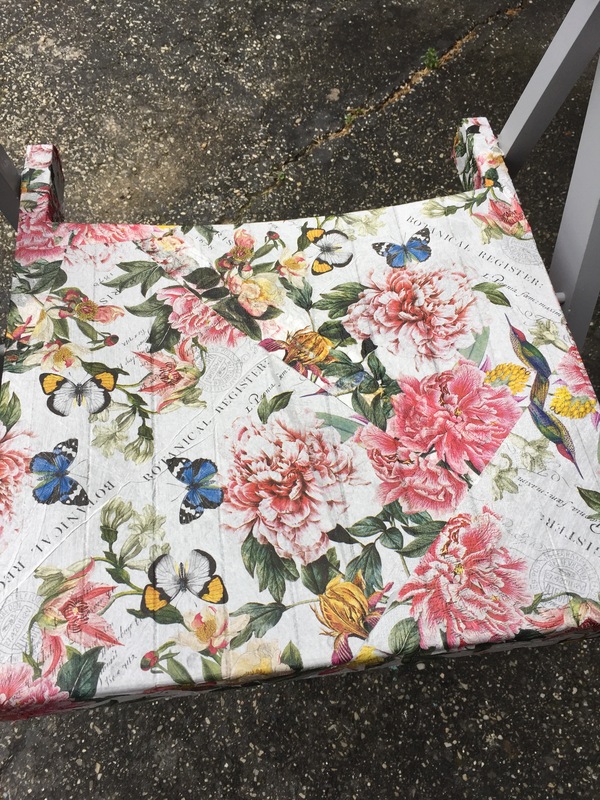 Next, I used the Mod Podge intended for fabric and brushed it on the surface of the chair with a foam brush in the area of where the napkin will cover. 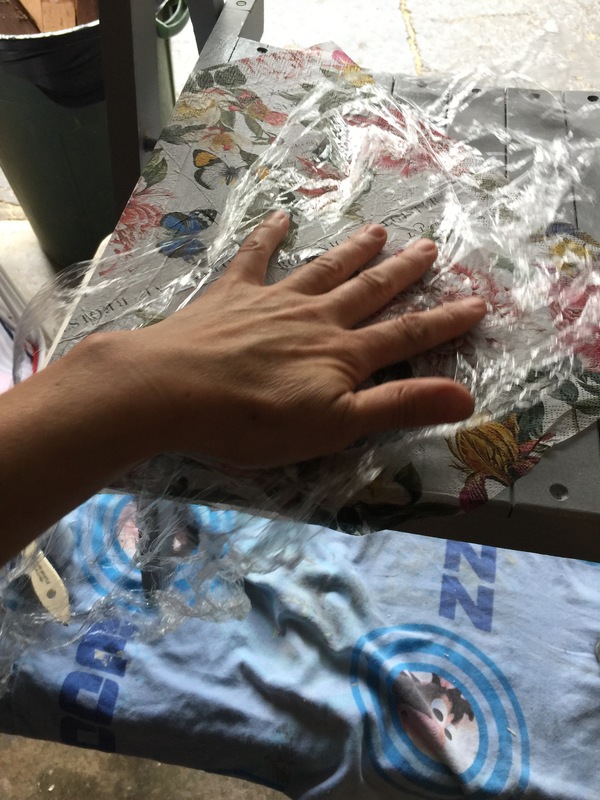 I lay down the napkin and using a piece of clear plastic wrap I rub that over the napkin to minimize any creasing. 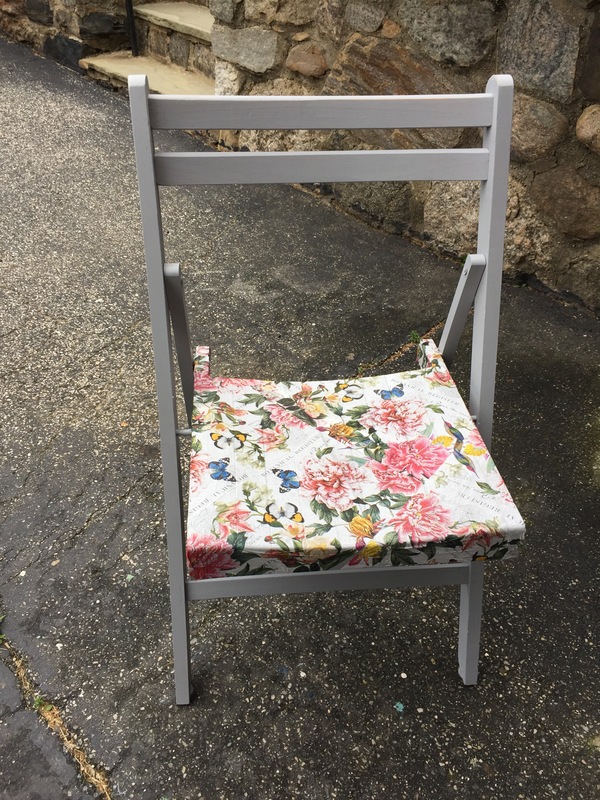 I didn’t really mind the creasing too much because I wanted the chairs to look a bit worn and distressed anyway. Rub really well all over the napkin surface. 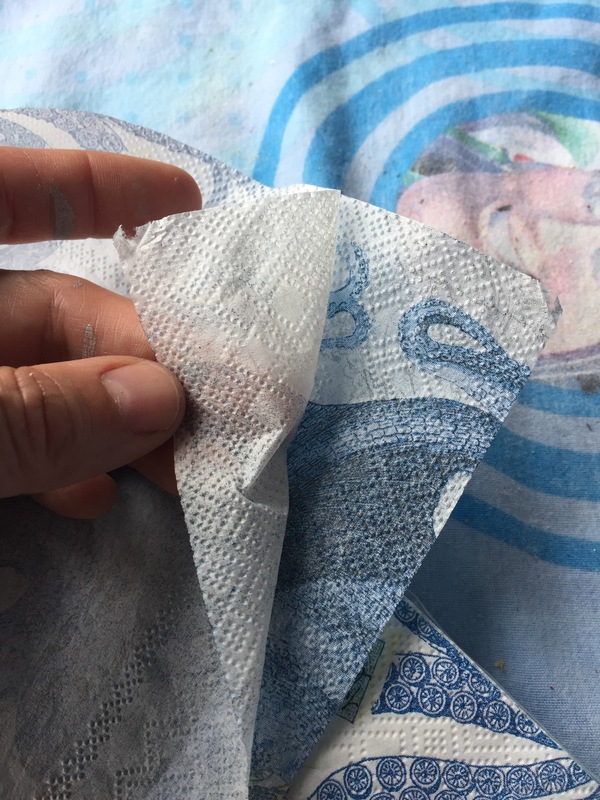 When it’s dry I used a sanding sponge on the edges to cleanly cut my edge of the napkin. Don’t worry if there are some missing spots. Just repeat the same steps and let dry. The piece of napkin will blend in seamlessly. 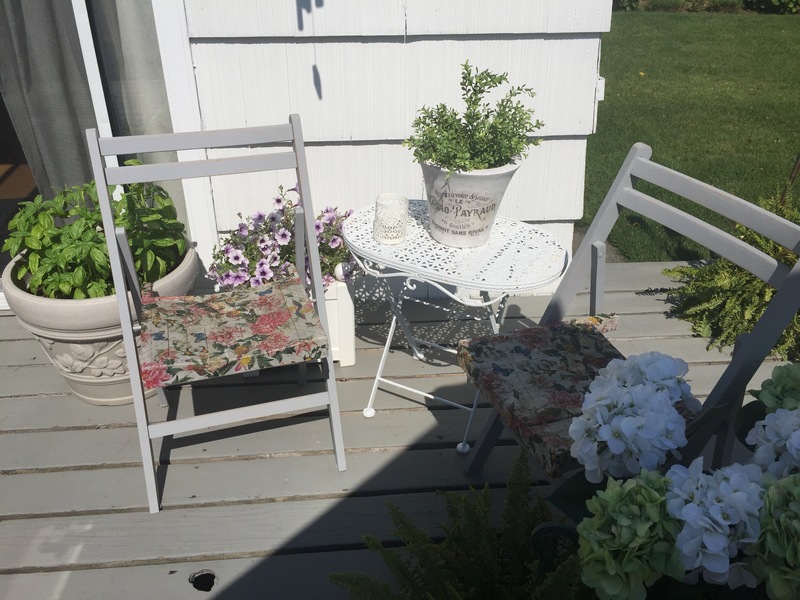 After it dried I used the hard coat Mod Podge to seal it for outdoor use. I also thought it needed a little ageing and distressing so I used some Minwax special dark wax to give it a little patina and make it look more aged. Here they are all done! 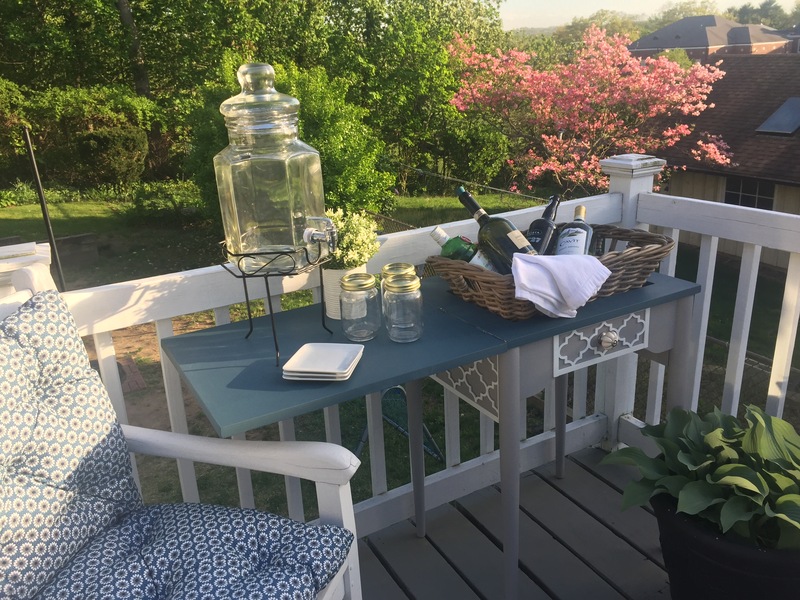 They look so adorable on my deck! 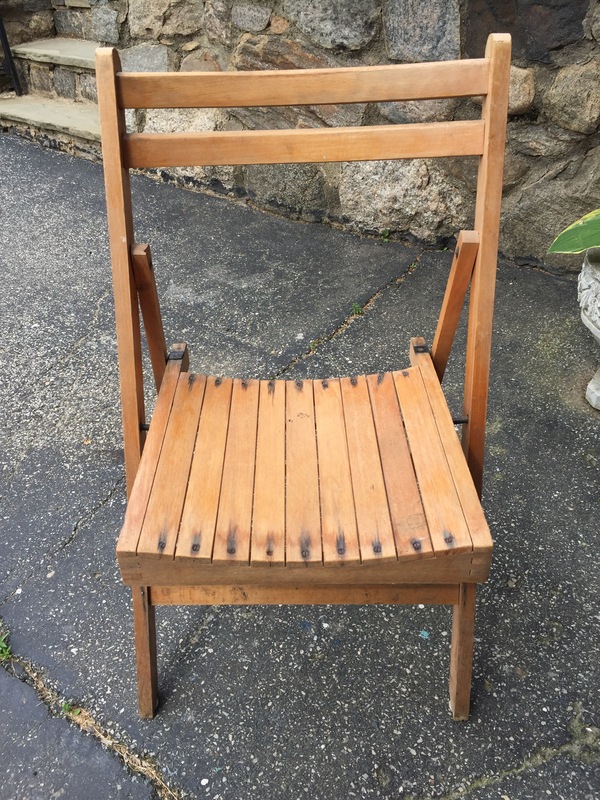 Now I have some pretty extra seating next time I have a party! I just love the aged, old look I achieved! Before and After!! 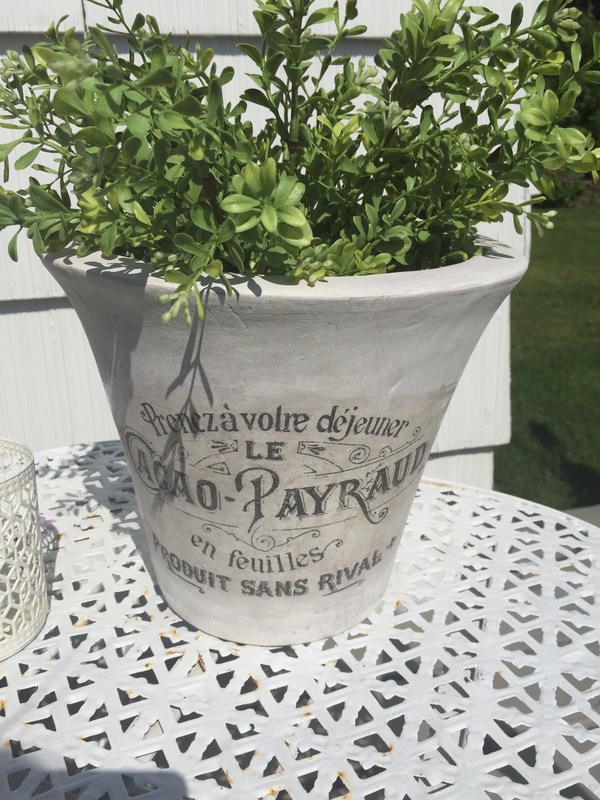 Go check out Mod Podge online or at your local craft store and see what you can create! 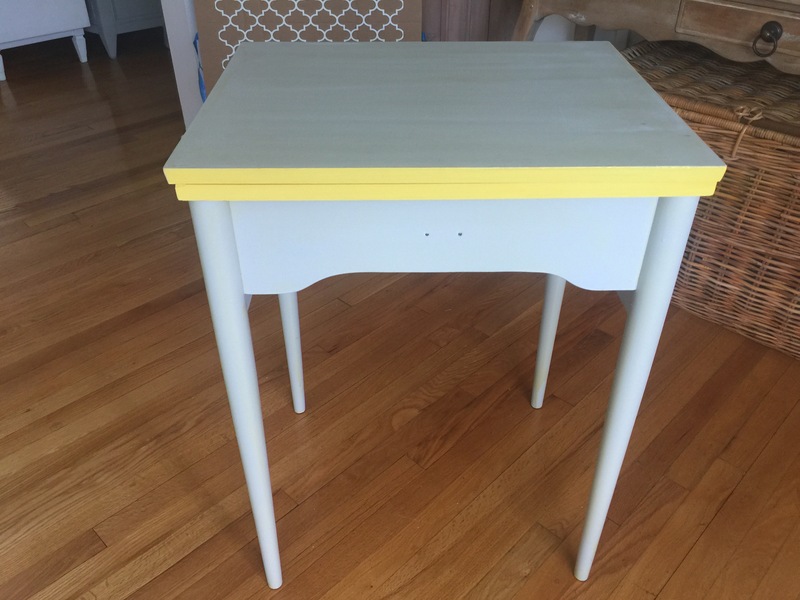 If you are an active, furniture flippin’ blogger, and you’d like to participate in future contests, please contact: info@fabfurnitureflippincontest.com. Disclosure Policy: This post may contain affiliate links. All opinions are 100% my own. 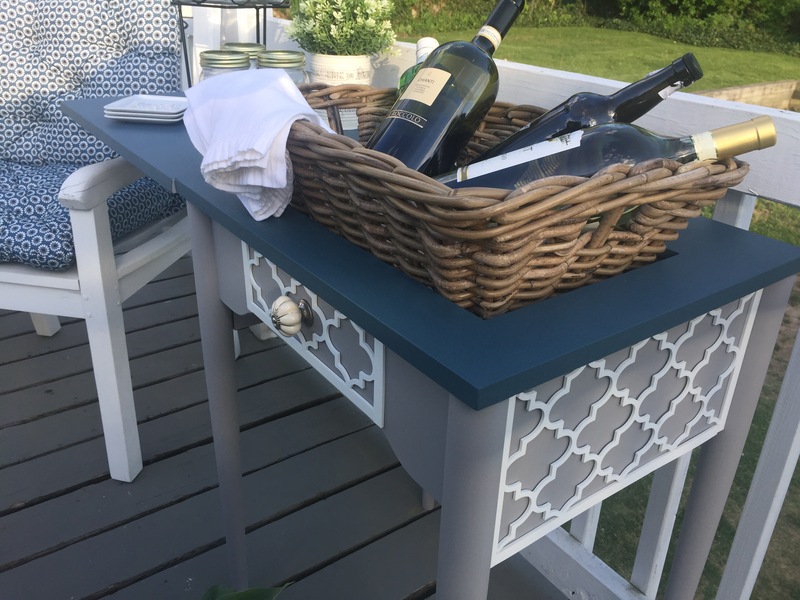 I was provided the O’verlays product to complete a project for this contest. Happy Spring Everyone! 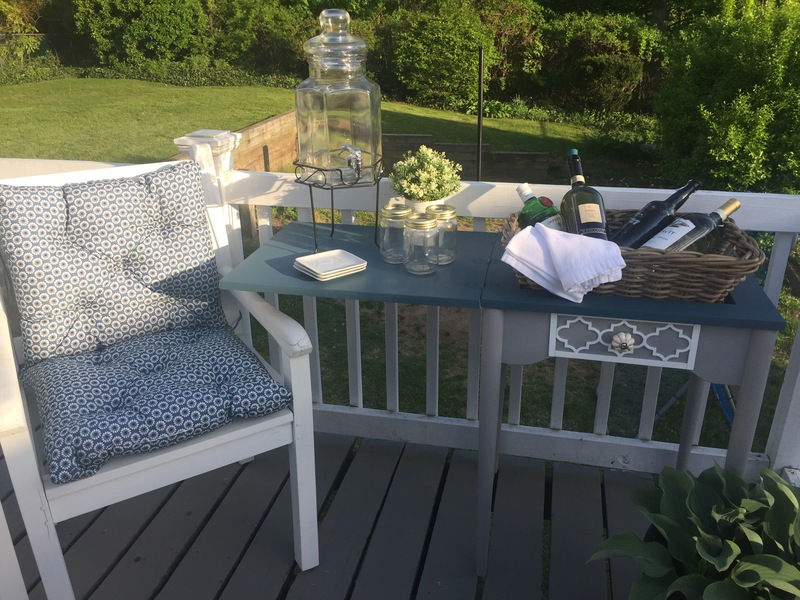 The weather is finally warming up, the flowers and leaves are blooming and its that time of year again for another amazing Fab Furniture Flippin’ Contest! 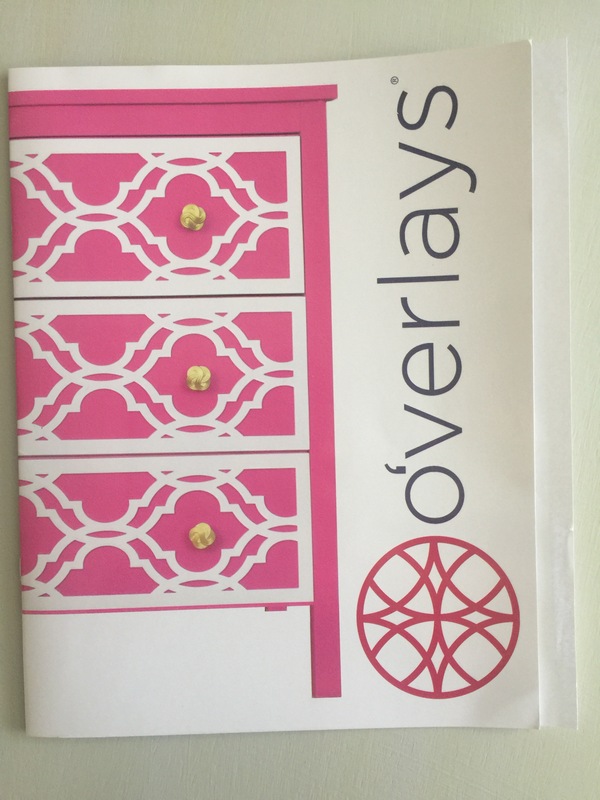 This April we were lucky enough to be sponsored by O’verlays. 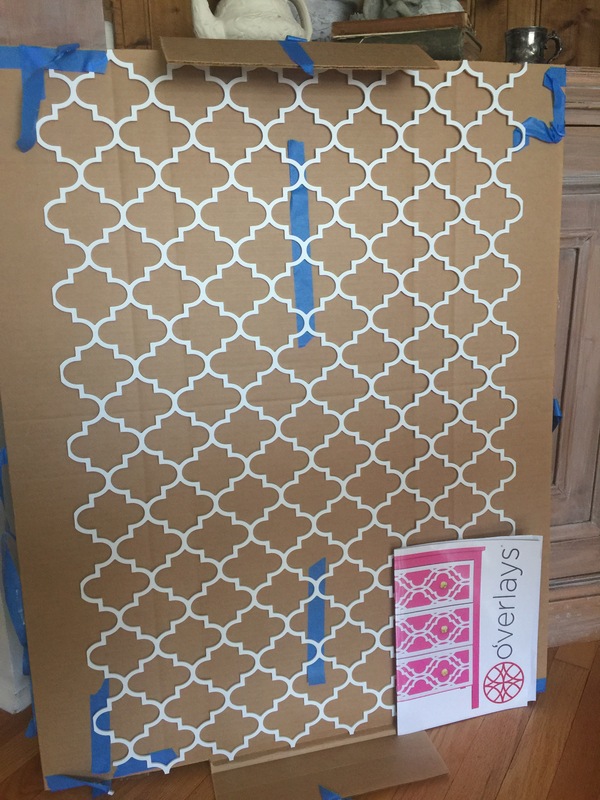 O’verlays are lightweight decorative fretwork that come in many shapes and sizes. They are paintable and are able to attach to furniture, mirrors, walls and glass using an adhesive. 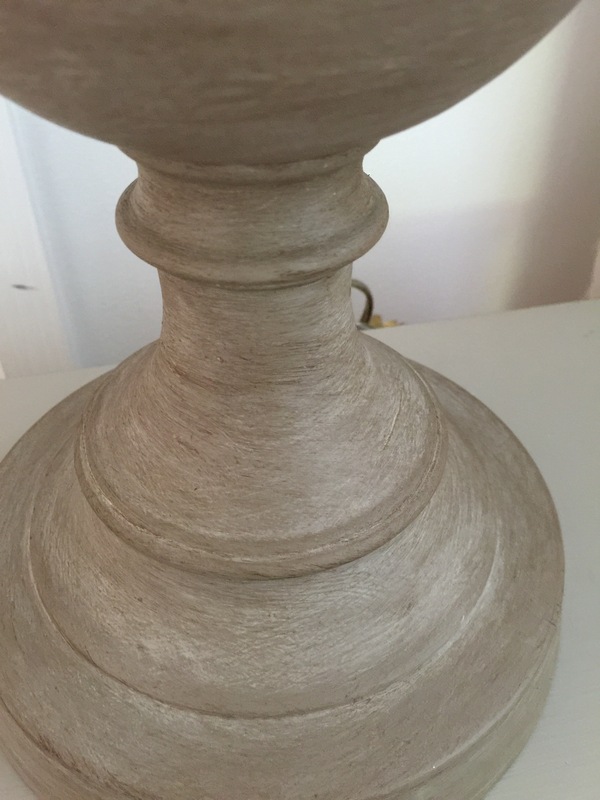 They’re great for dressing up a plain piece of furniture that needs a some wow factor! 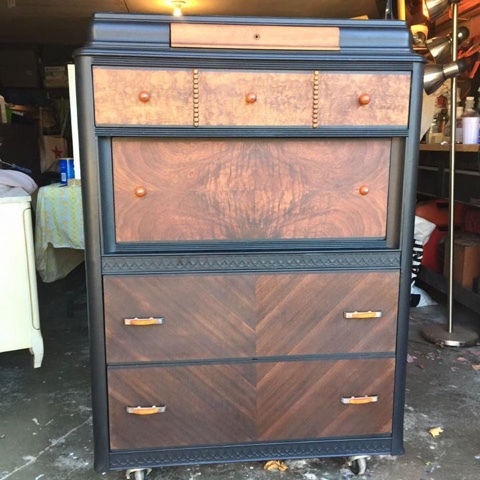 If you surf Pinterest and other decorating websites and blogs, the idea of a vintage sewing table turned beverage center has been floating around for a while now. 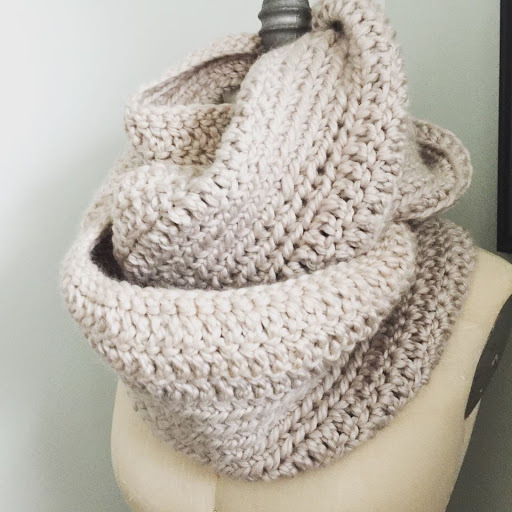 I love seeing all the different ideas out there and I always get the itch to make one myself. 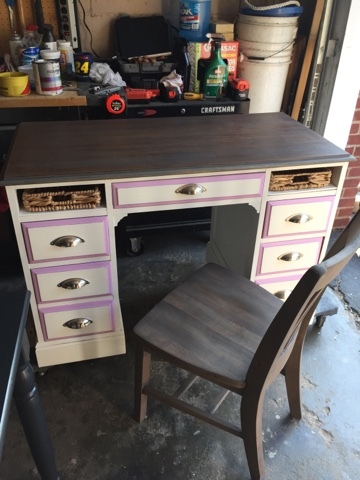 I purchased one last year and started to paint it but then I just got too busy with other projects to make something for myself. 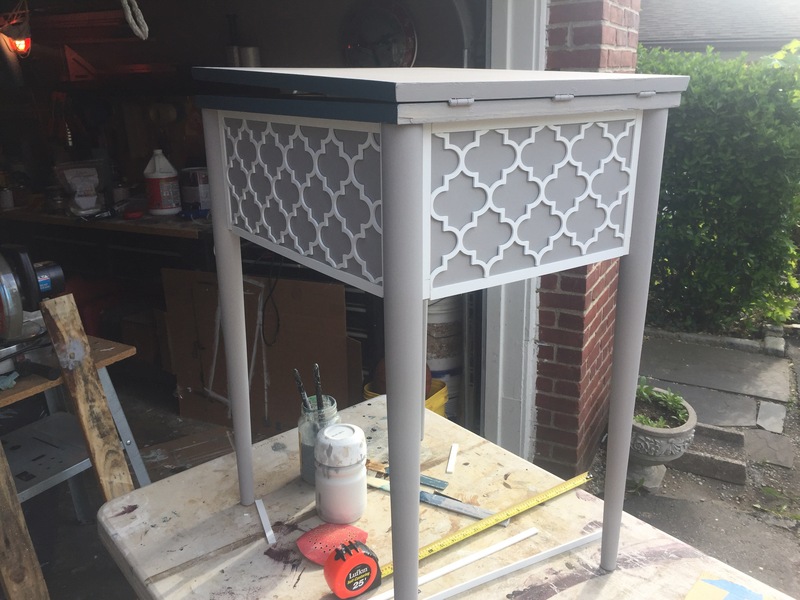 But once I heard that O’verlays was the sponsor for this months contest the wheels started spinning in my head and I knew exactly what piece I wanted to flip…the sewing table! I rarely get to paint anything for myself, so this was an especially sweet treat! 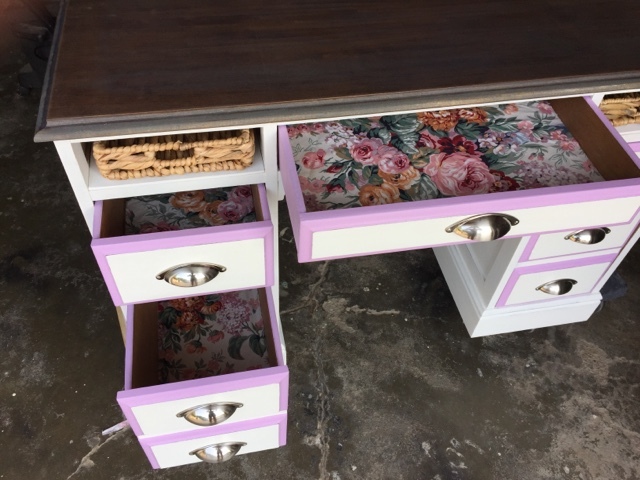 I looked all over to see if I had a before shot of my sewing table, but to no avail…I found this similar one on a google image search to give you an idea of what I started with. 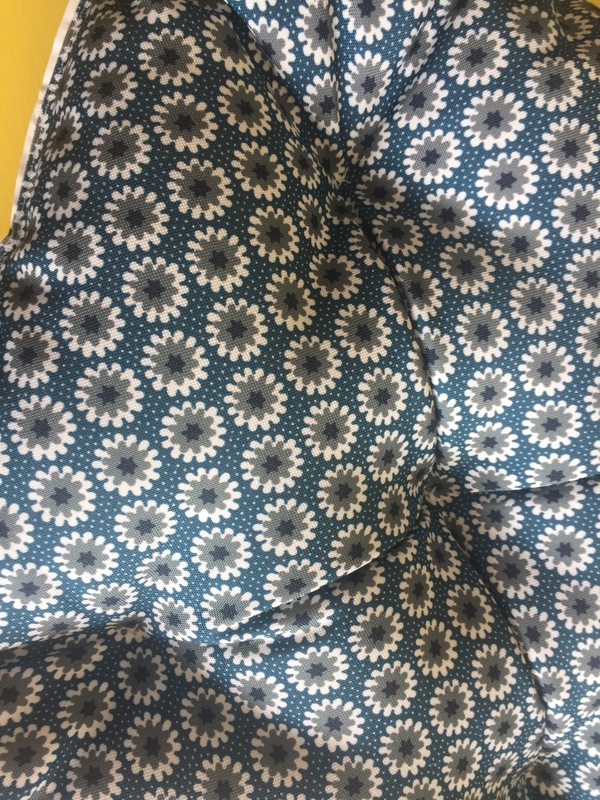 The sewing machine was removed from the opening in the center and I went to work. 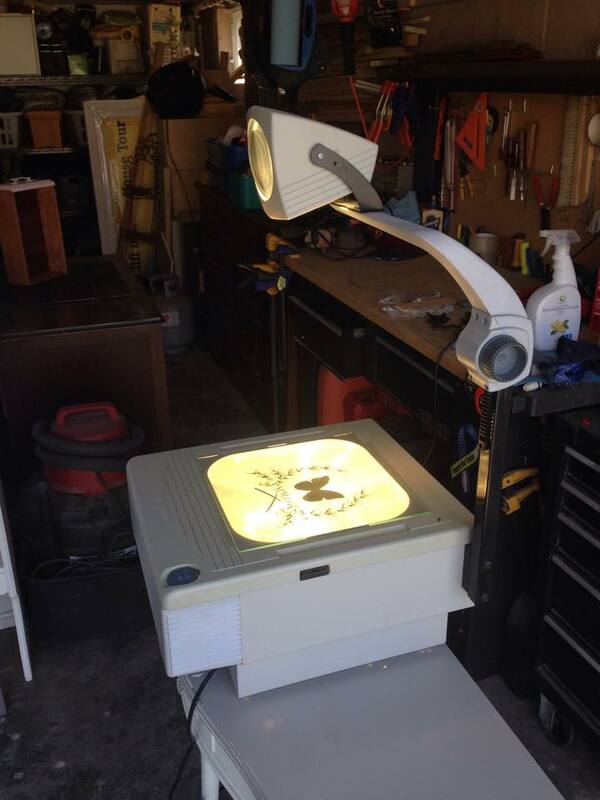 This is the real sewing table! As you can see, its pretty similar to the one above. 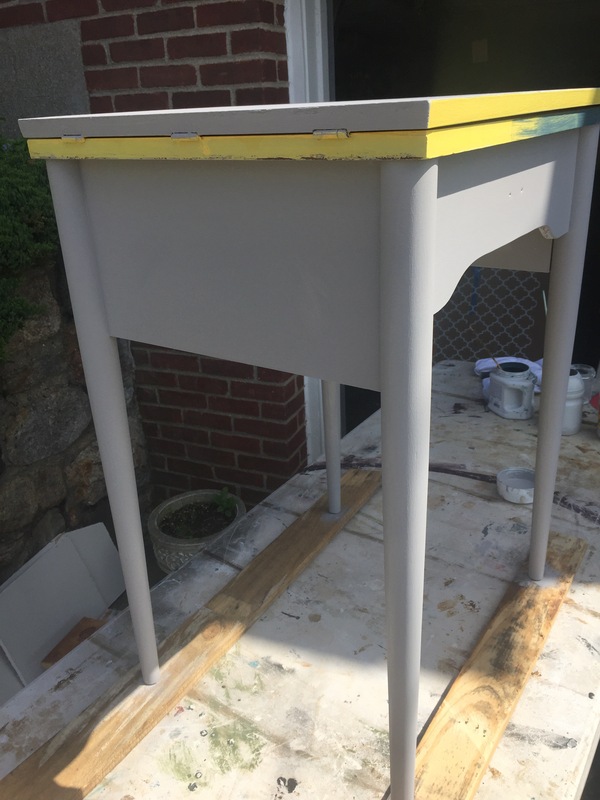 I started painting it gray and yellow, but I just wasn’t loving it. 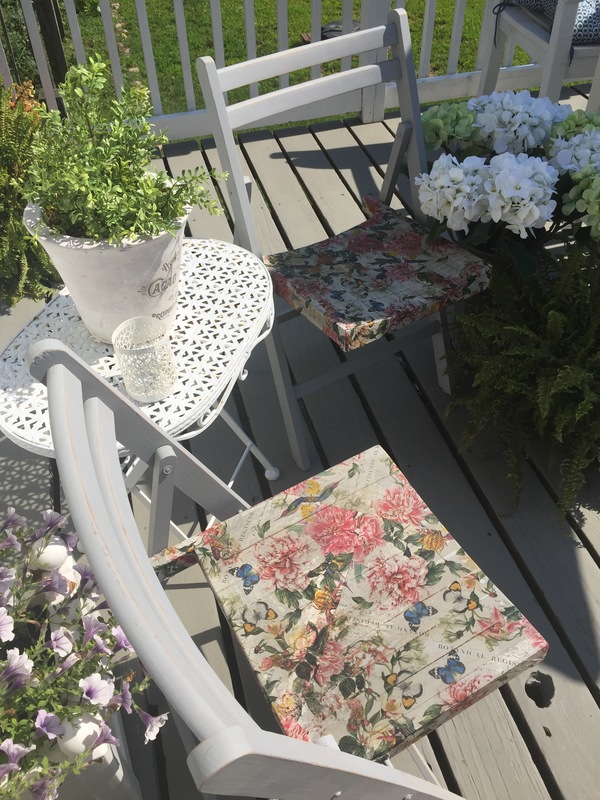 I just purchased new outdoor chair cushions from Ikea and I thought maybe I could use them as my inspiration piece! Using a pillow, rug, textile is always a great place to start when you’re trying to come up with a color scheme. I wasn’t sure what to expect when I got the package from O’verlays. I had never used a product like this before, but I was ready for the challenge and so excited! When I received the package from Overlays, it was taped up so well, you needed a degree to open it!! But that’s good!! I appreciated all the care that went in to shipping it. It came with a brochure and instructions that were very easy to understand. I received one Jasmine panel which was 24×36 and 4 long strips to frame it. The pieces come in white. 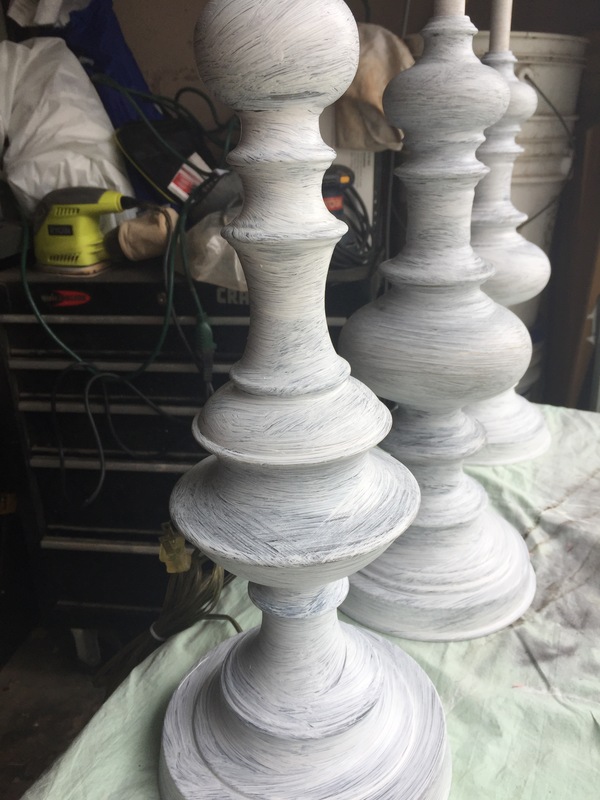 You can paint them before you attach them but I decided to keep them white for this project. 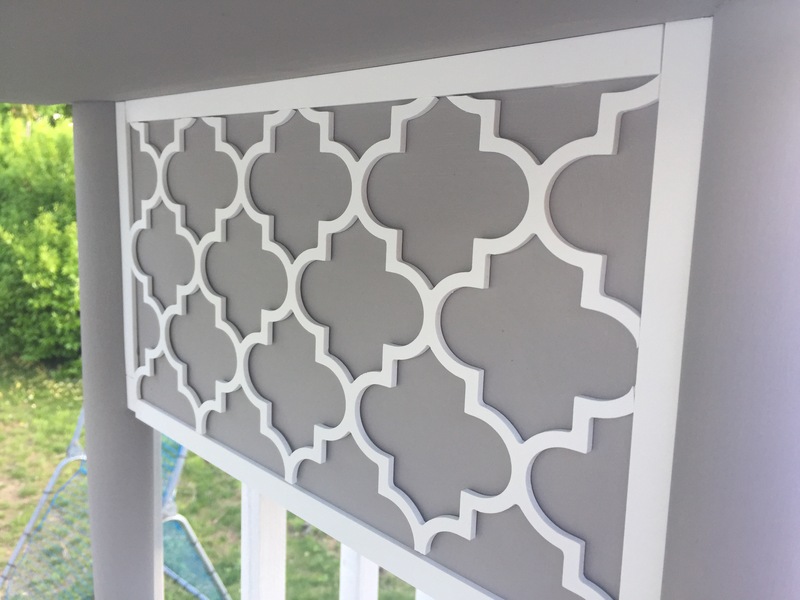 Here is the “Jasmine panel. It’s huge, and can cover a lot of area. I still have quite a bit left over. 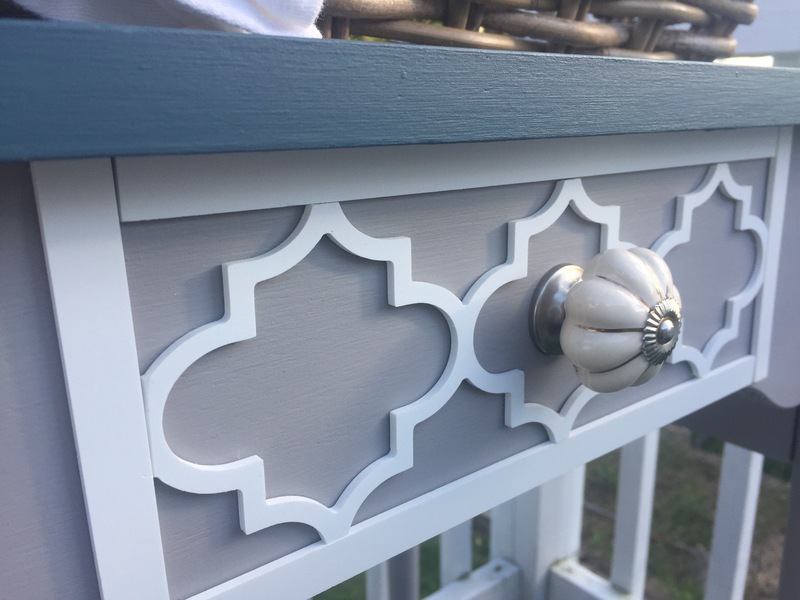 This is a closeup of the outdoor cushions I purchased and I wanted to use the slate blue and dark gray colors with the white O’verlays for contrast. I had some leftover paint from some other projects that I had done. 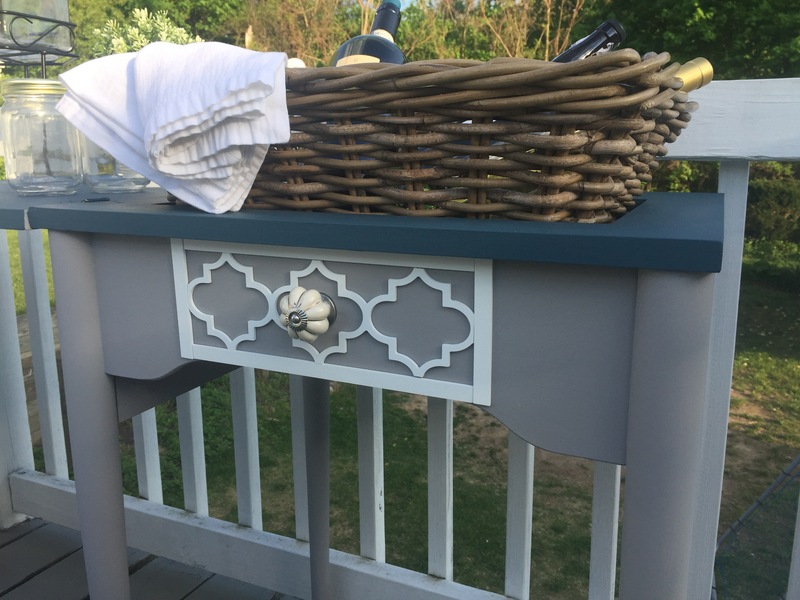 Actually, the gray paint is a Behr color called “Smokey Wings” that was an oops paint I got for $5 at Home Depot!! 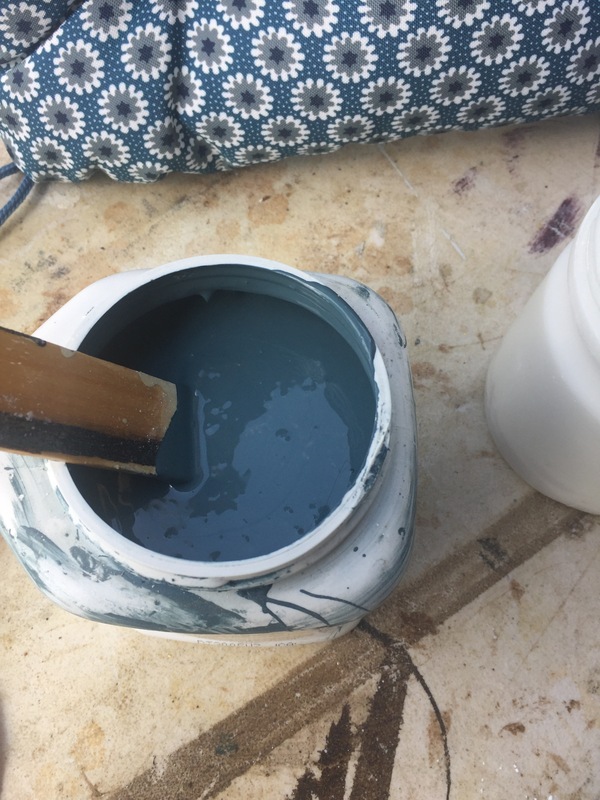 The blue was a sample pot from Sherwin Williams. 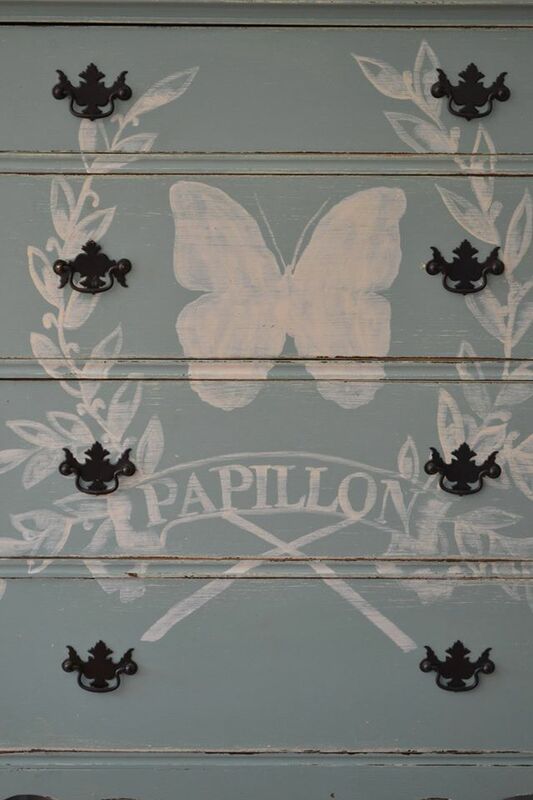 I made my own Chalk Paint using calcium carbonate that I purchase on Amazon. I add about one cup of cc and a couple of tablespoons of water to 1 quart of paint. Mix well. The blue is a great match! 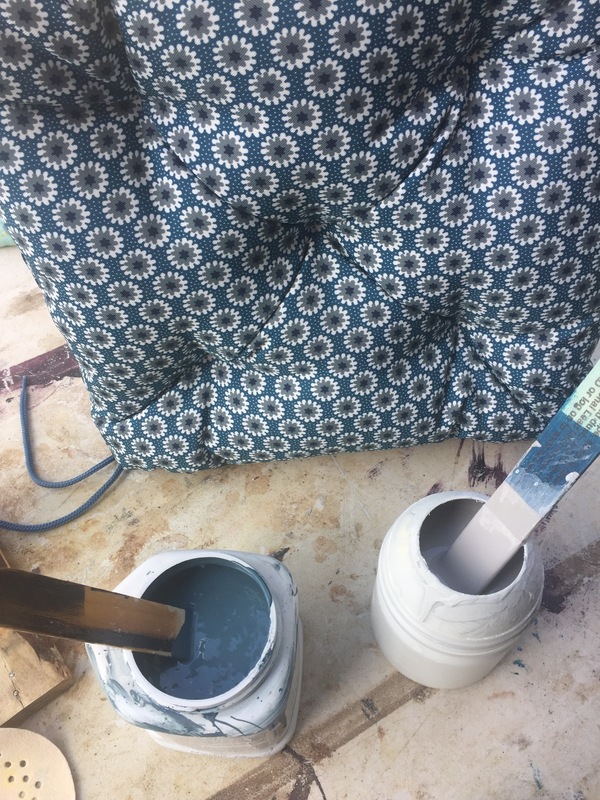 Before I started painting, I made sure to clean the piece thoroughly first with some TSP (tri sodium phosphate) and then I rinsed it with some vinegar and water. The TSP really gets off any gunk and build up. 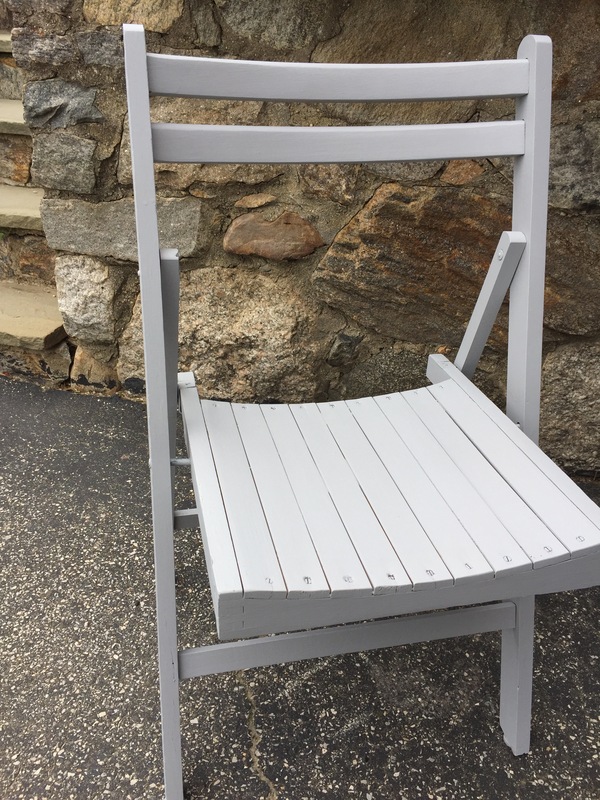 I let it dry, and I sanded the old paint down very well with 150 grit sandpaper to give it a “tooth” so the paint would adhere. 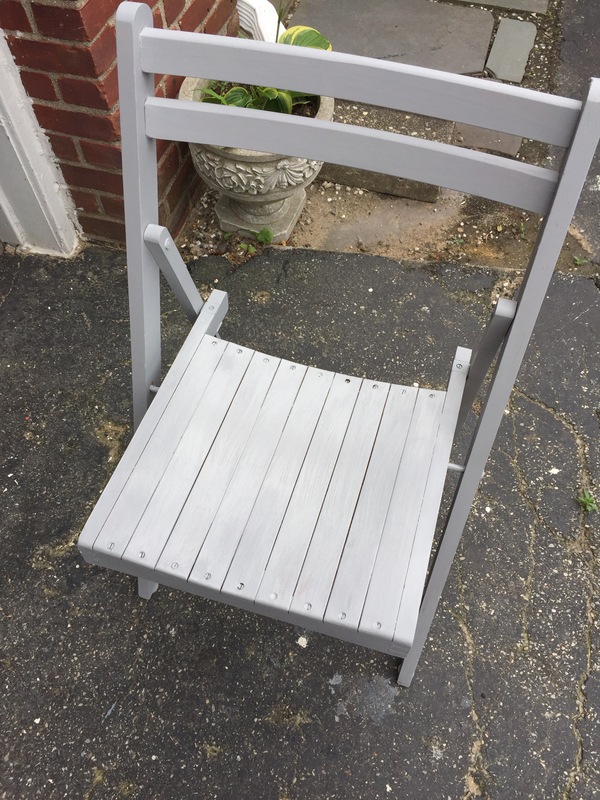 This was one coat of the gray on the bottom so far. Here is the piece painted and ready to get Overlay’d!! I think the colors match the cushion perfectly! 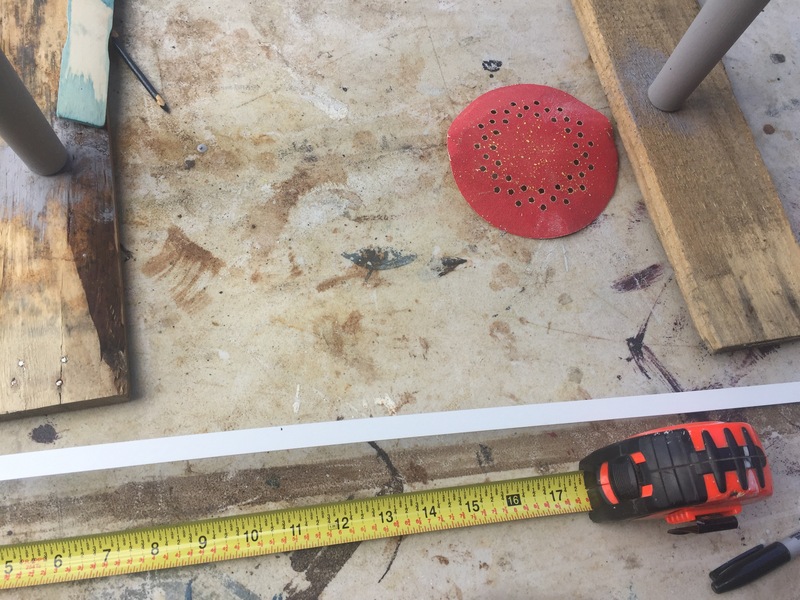 All you need is a matte knife, a measuring tape, liquid nails or some other type of simple adhesive, that’s it, it’s so easy! Make sure to measure correctly before cutting though! Use the old adage, “Measure twice, cut once”! I probably measure 4 times just in case! 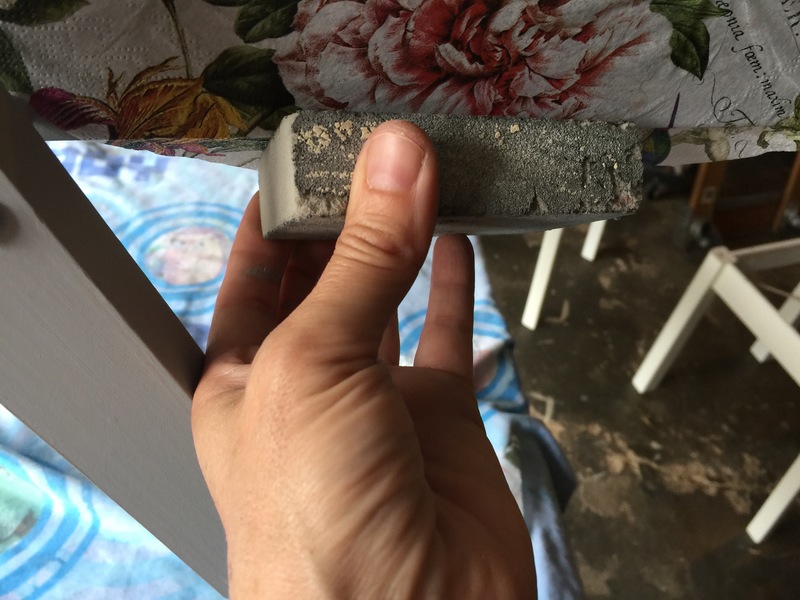 I used a little piece of sandpaper to sand down the edges to remove the roughness. 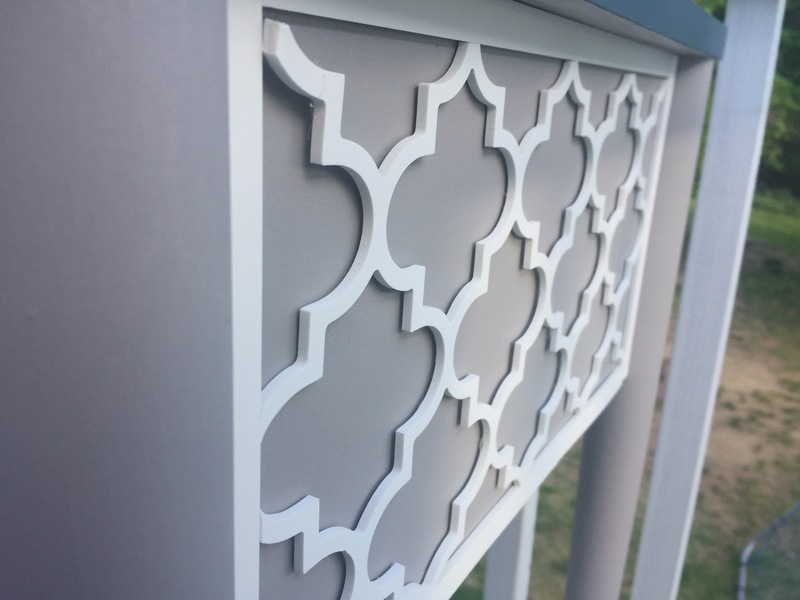 You can spray paint this trim too! The options are endless! This is the first side almost done. I love it!! I used liquid nails to attach the Overlays on there. 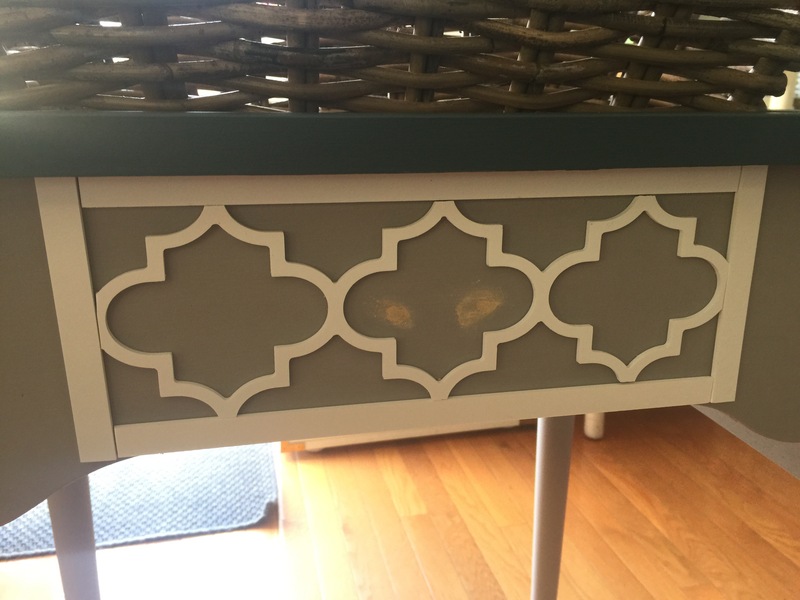 I love the Moroccan design! 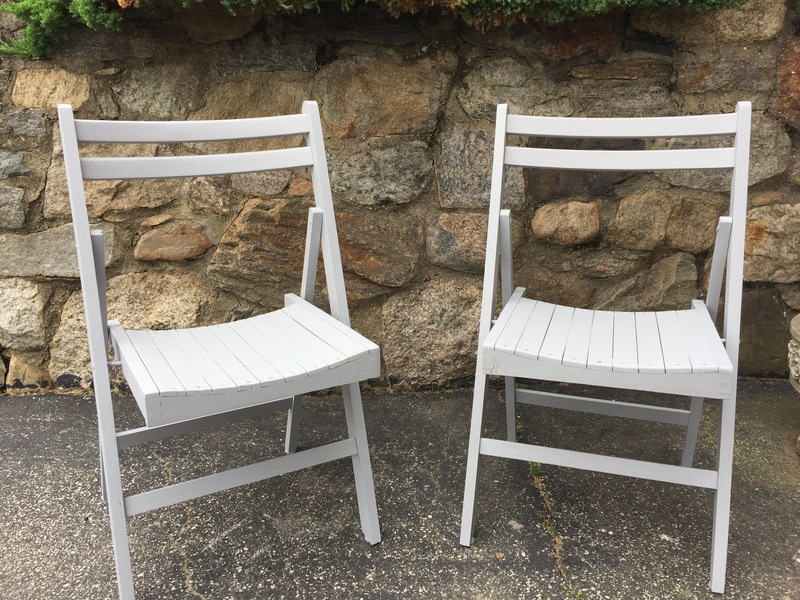 I decided not to paint them, because I loved how the white popped against the gray. 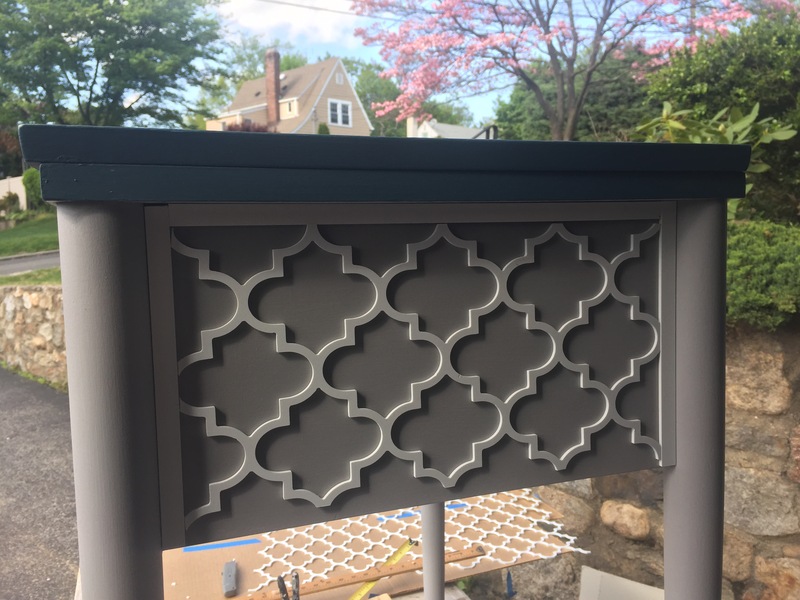 Notice the trim all around the design. 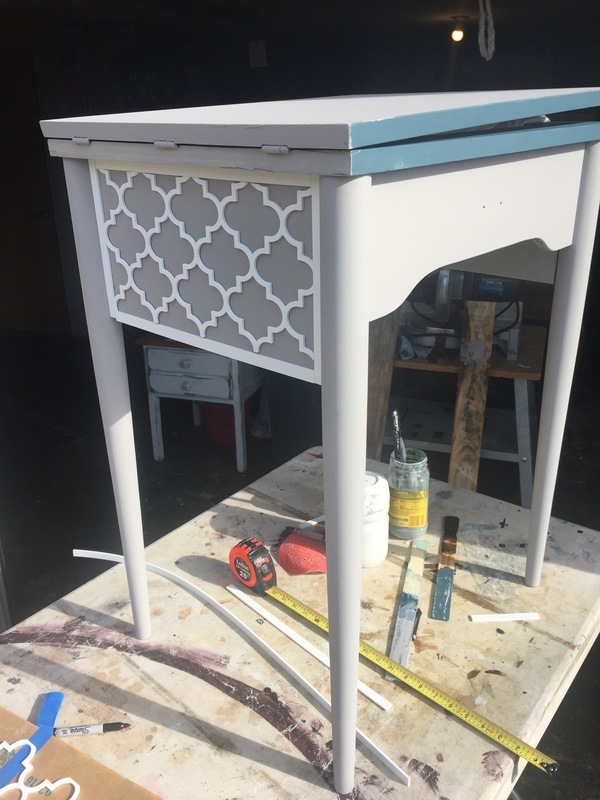 I glued the side trim, then the top then added the design piece and then the bottom trim. Just the front piece to go, almost done! This project moved very quickly, once I got the hang of scoring and cutting the O’verlays, it was all up in about a half hour or so. 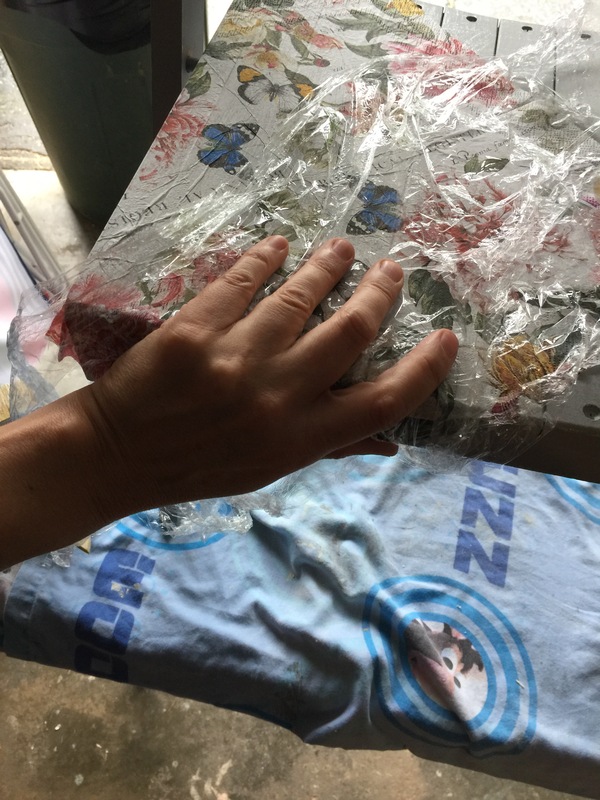 After the adhesive was dry, I made sure to seal the piece using a couple of coats of varnish so that I could leave it outside although I probably will bring it in if it rains, just to be on the safe side. 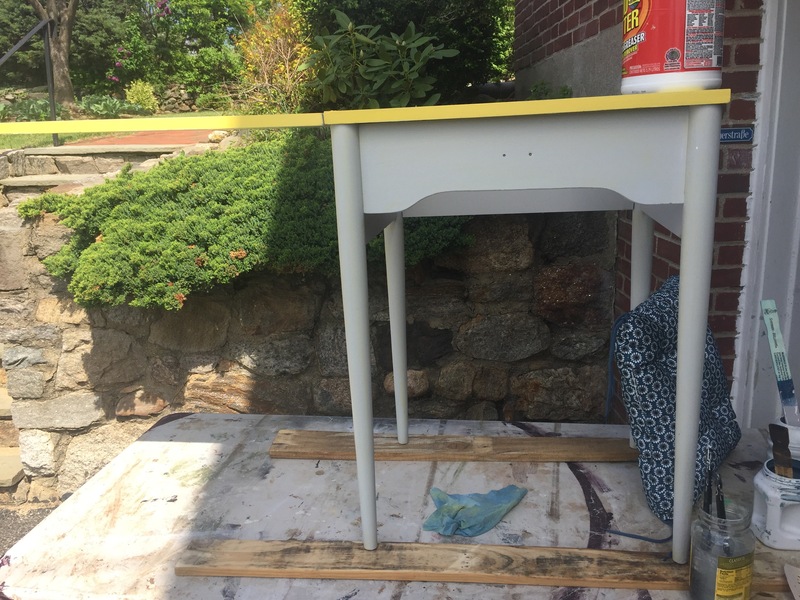 The sewing table originally had a little handle in the middle, but I filled in the holes with some wood putty and drilled a new hole in the middle to attach a different knob. I love how this handle adds to the Moroccan vibe! I think I got this one at TJ Maxx. And here it is! I just love how it came out! It works perfectly with my new cushions!! I can’t wait to entertain out here! For the time being I just used a basket I got from Ikea that was the right dimensions for the opening. 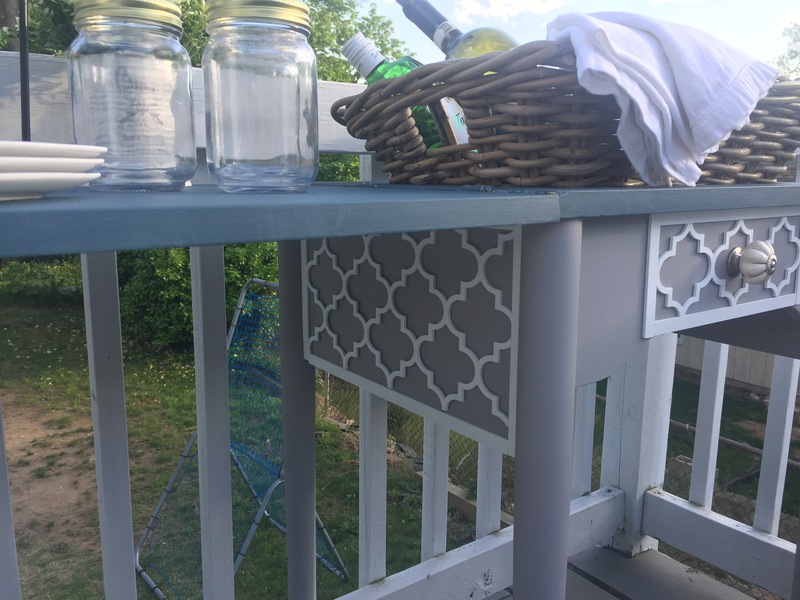 I still need to buy an aluminum pan that will fit better inside the opening when I want to put ice and beverages in there. Most restaurant supply stores carry them as well as Amazon. 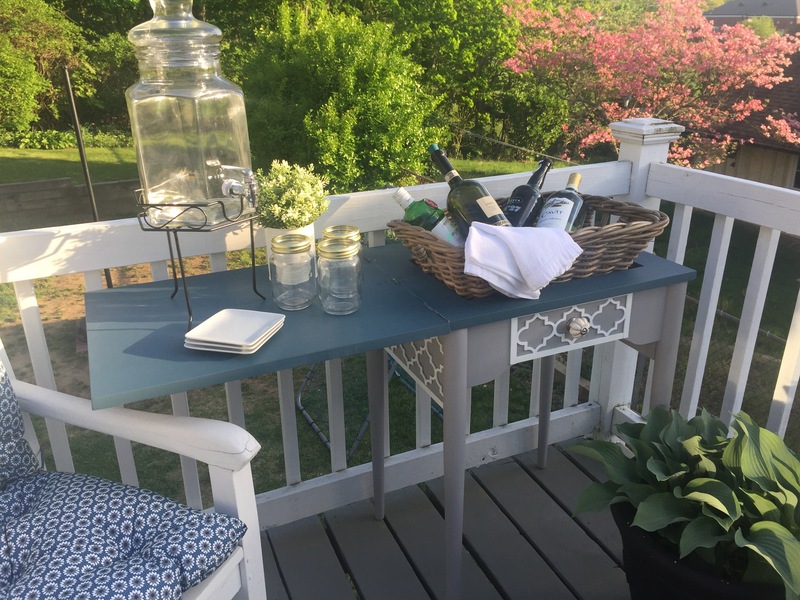 I can’t wait to entertain on my deck with my beautiful updated new beverage table! I love how it turned out! I highly recommend using these Overlays! 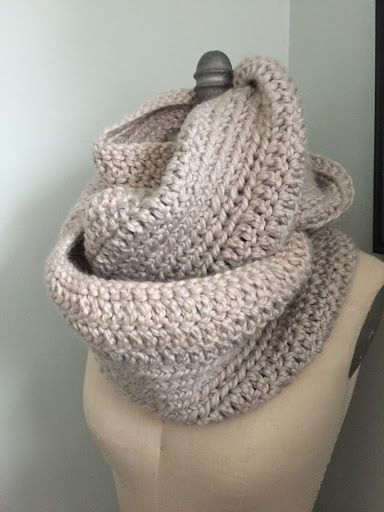 They really give a piece personality and make something drab look totally fab! Give them a try! 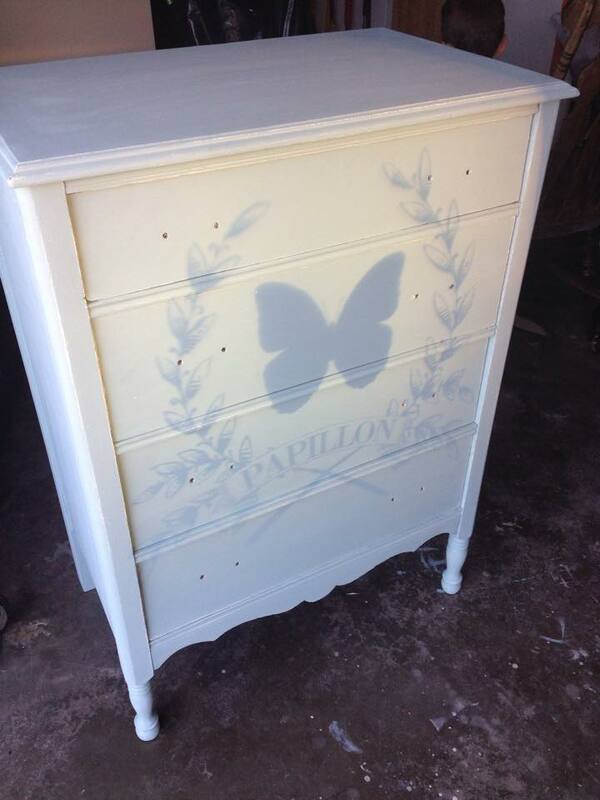 The Fab Furniture Flippin’ Contest go to their website and get all the info there! 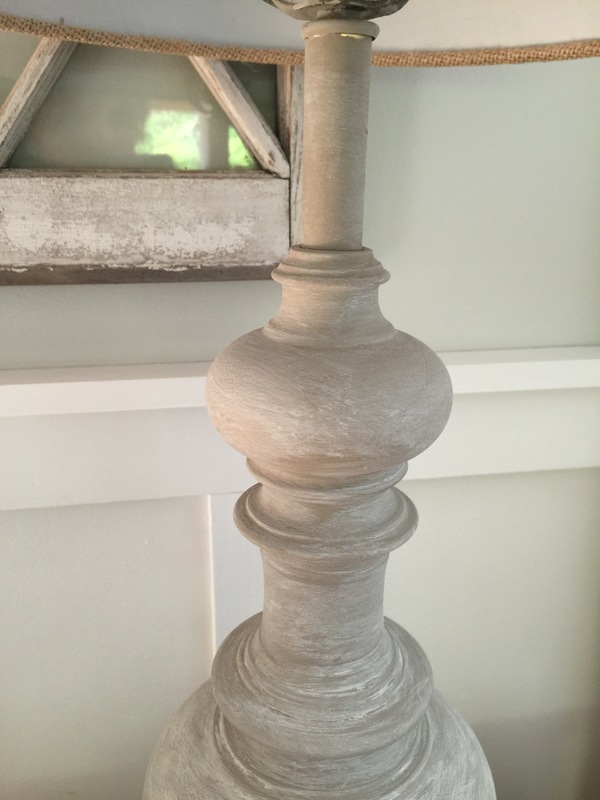 The Restoration Hardware trend is so popular these days! 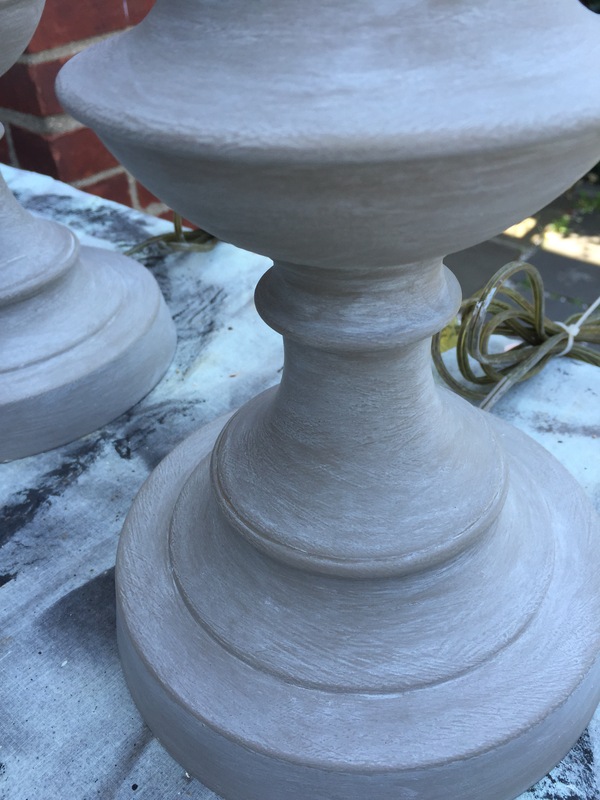 If you search the web or check out Pinterest you can find hundreds of inspiration photos and tutorials that will help you achieve that weathered, dry brushed technique. 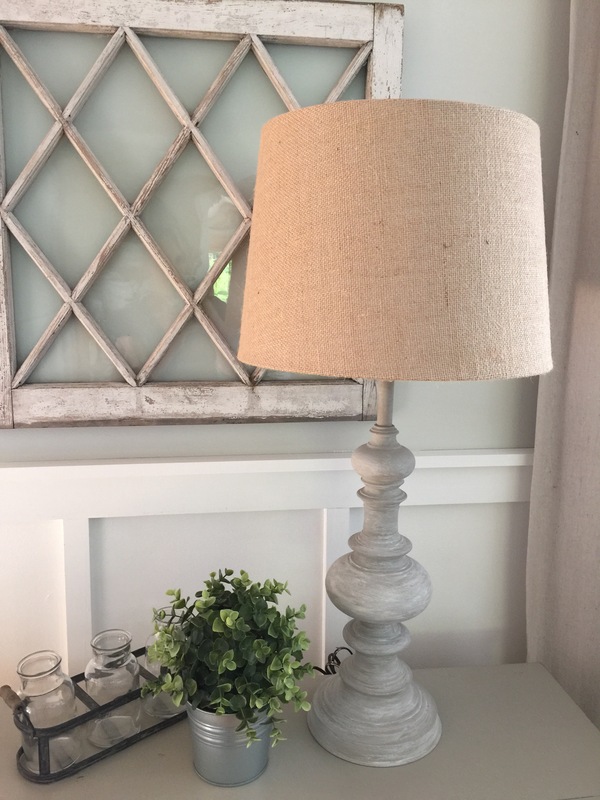 I had a client who wanted a different look for her brass lamps and I suggested this kind of look for them. 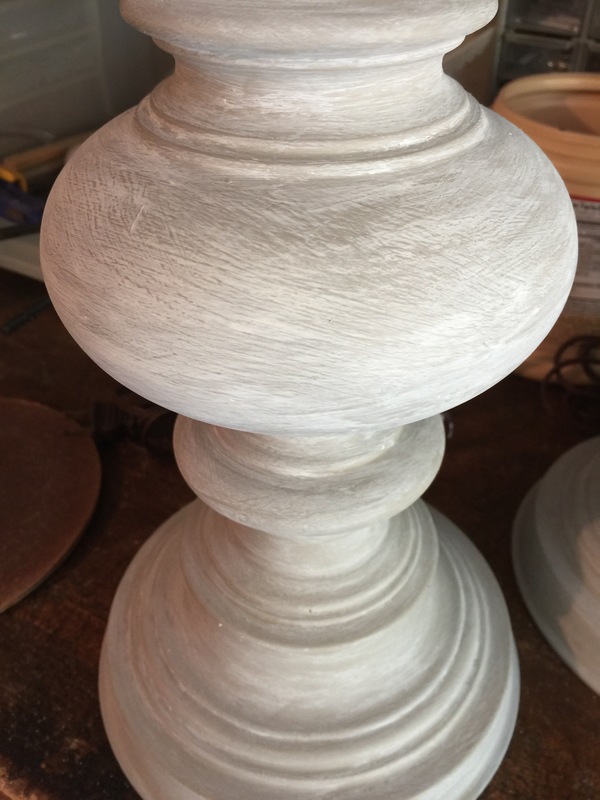 While the look is more on trend, it’s still an old world, yet modern finish perfect for a more updated interior. 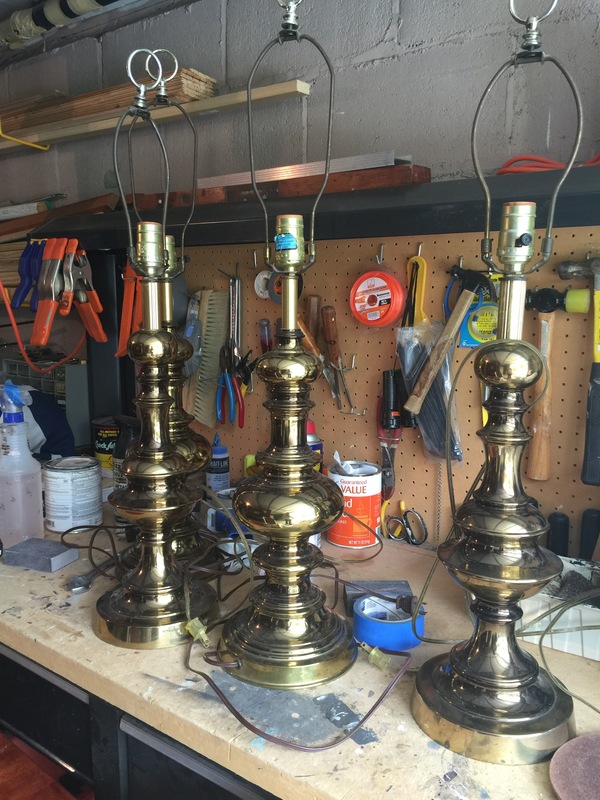 These are the lamps in their original state. There were two pairs of lamps. One pair was going in her bedroom and the other in her living room. 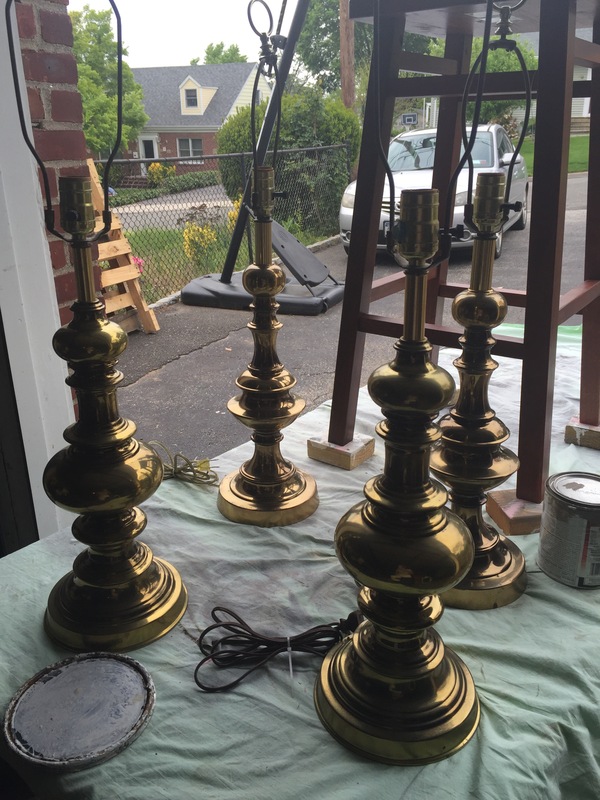 I started by cleaning the lamps very well with vinegar, dish detergent and hot water. 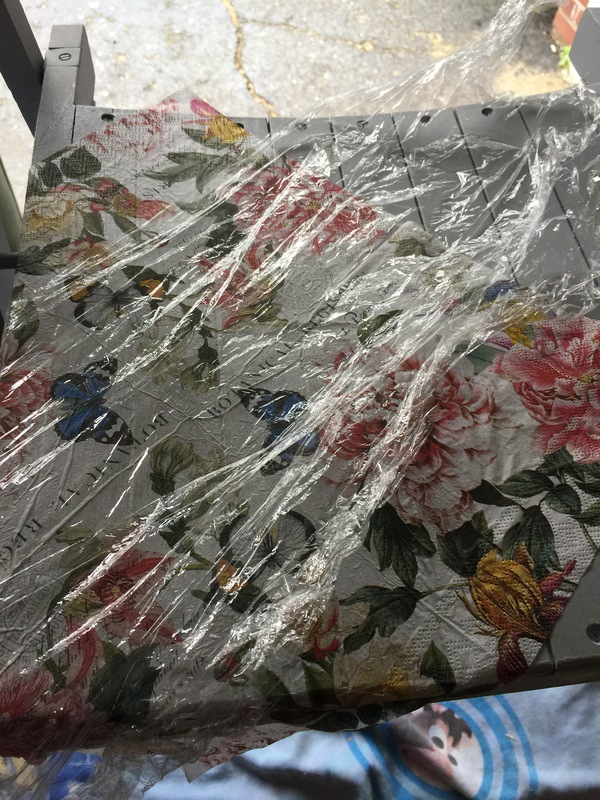 I used a scotch brite pad to remove any grime and residue. 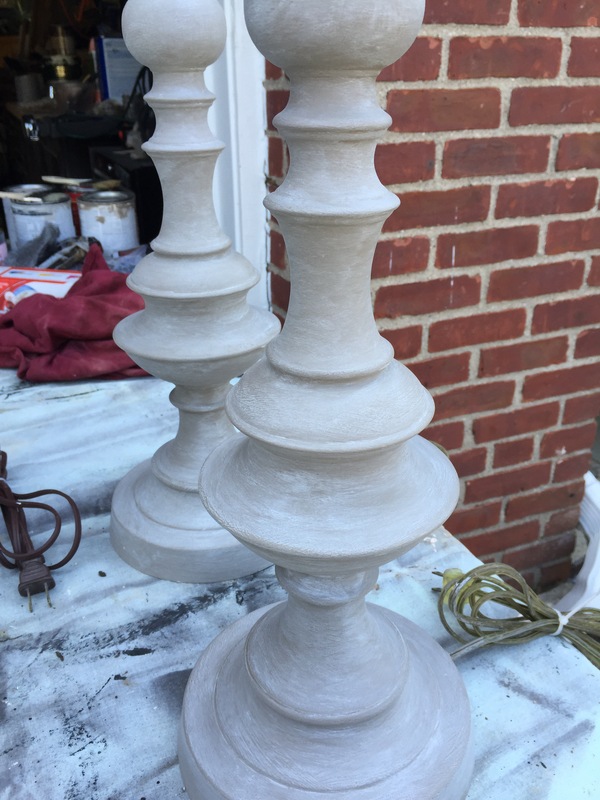 I primed the lamps with Zinzer’s Bin Shellac primer which works on pretty much all surfaces. I applied 2 coats letting them dry well in between each coat. I just used a chip brush to apply the primer. 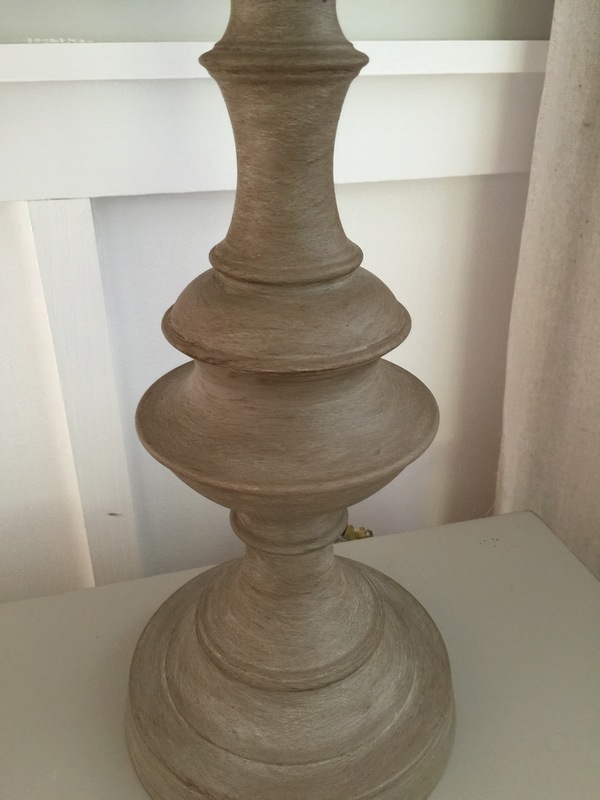 Then I applied Sherwin Williams Ovation brand of paint in Virtual Taupe. 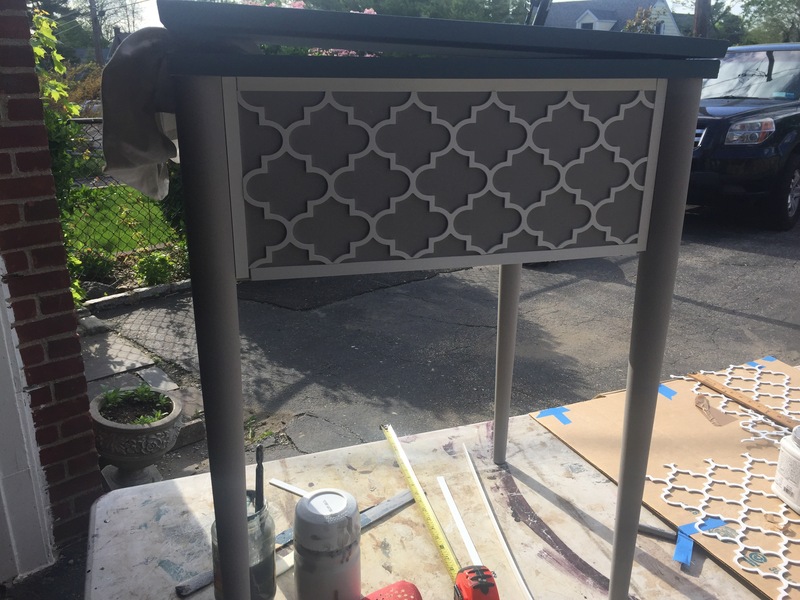 I used a matte finish. I also did two coats here drying well in between each coat. 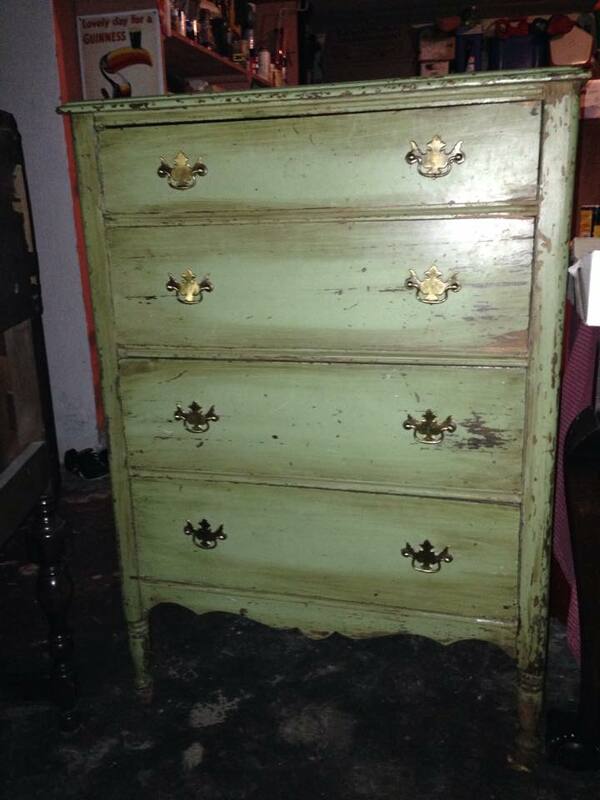 The color is very similar to Annie Sloan’s Coco Chalk Paint. 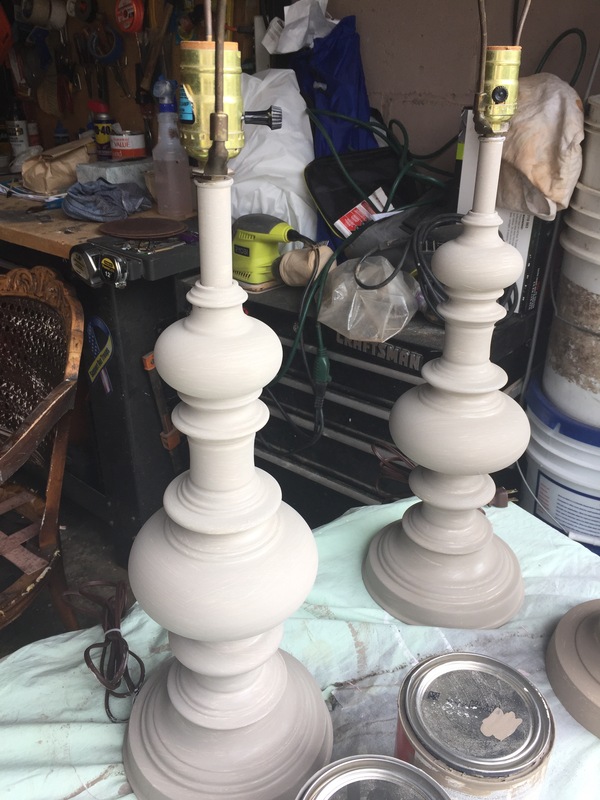 I painted all the lamps two coats of the paint and let dry overnight. 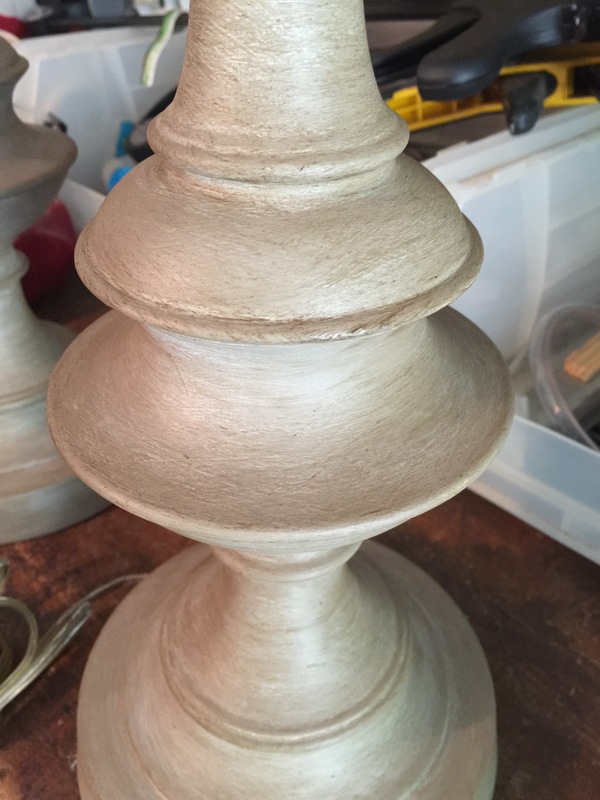 After I finished base coating the lamps with the Virtual Taupe color I mixed up my own DIY liming wax . For the liming wax I used a glob of my Johnson’s Paste Wax and mixed in some white latex paint I had. I used enough paint so the color would be opaque enough but still have some translucency. For the lamps that I wanted to stay lighter I used my chip brush again and just brushed on the DIY liming wax all over the lamp. I let it sit for a couple of minutes and then I used my blue shop towel to wipe off the excess very gently. I wanted to keep the texture of the wax in the grooves of the brush marks of the paint. It gives a really interesting texture and almost looks like stone. Here is another closeup of the white liming wax. This is the dark wax. 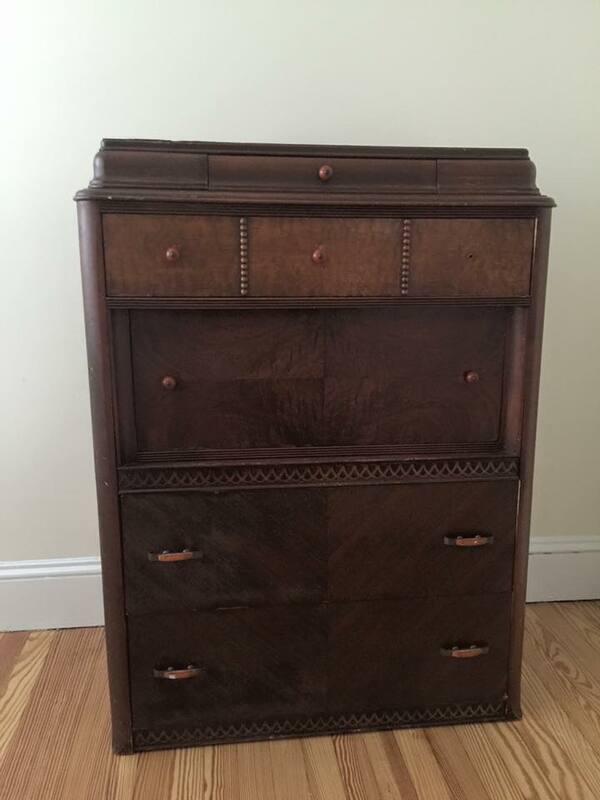 For this, I used my Johnson’s Paste wax again but this time I added some Minwax stain in Provincial. 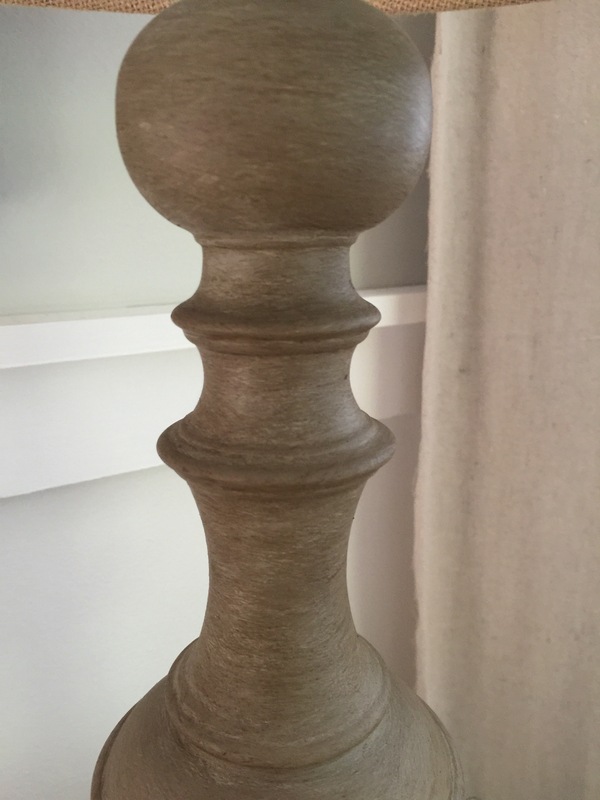 I used the same technique as before using my chip brush and applying the stain all over the lamp base. I let it sit for a while before wiping off very gently. 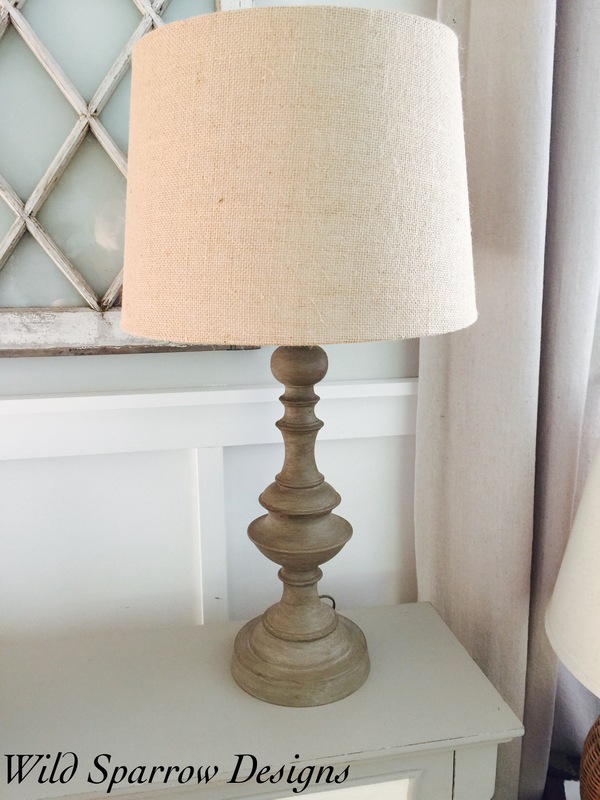 You may have to apply a second time if you want your lamp to be darker. 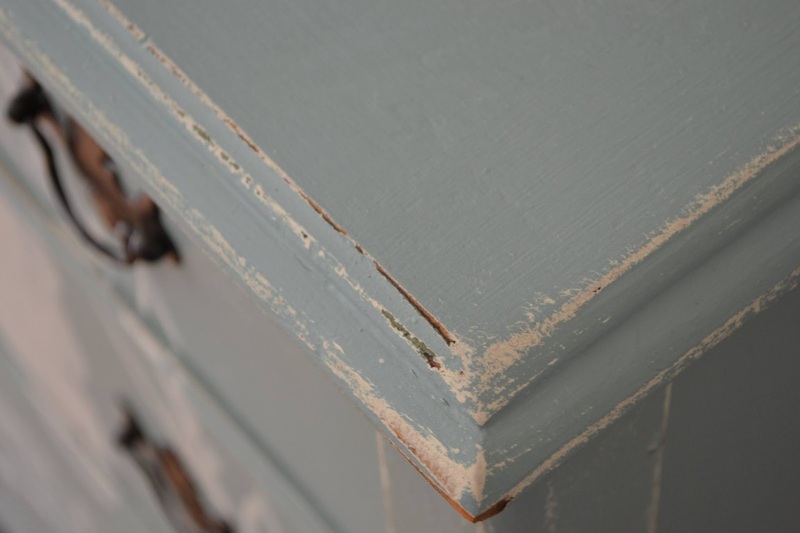 Alternatively, you can also use a bit of the liming wax first, let it sit a bit, wipe off and then use the darker wax. Play around and see what works for you! Here is the darker lamp completed. 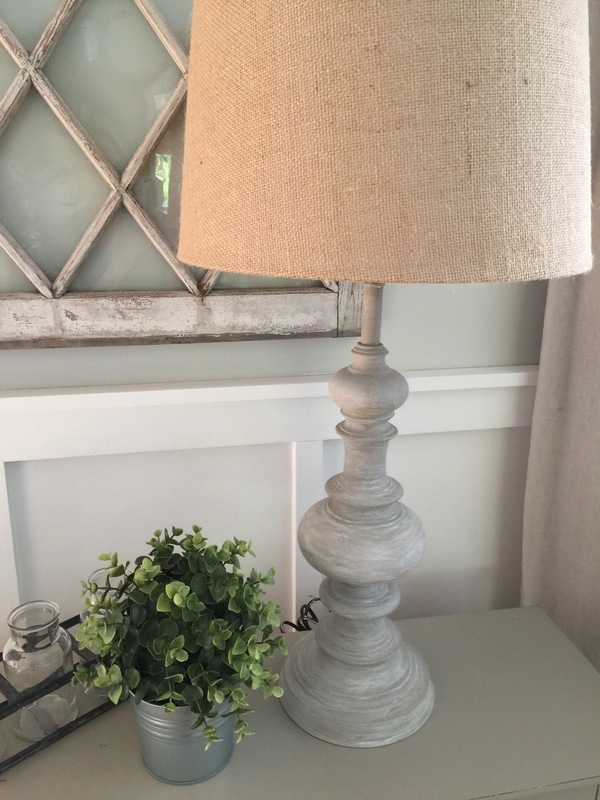 The paint and wax technique totally transforms this lamp into a greige, weathered patina finish! Another close up of the dark lamp. 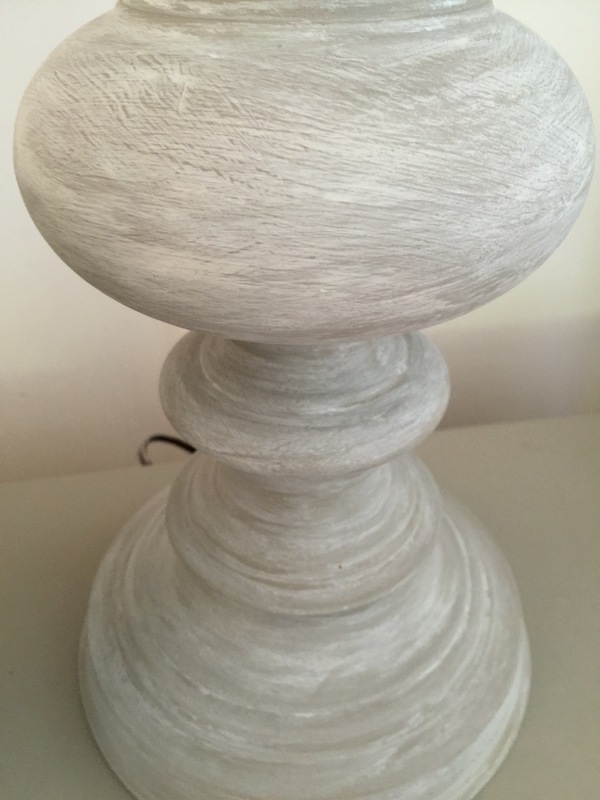 Here is the finished white liming wax lamp. 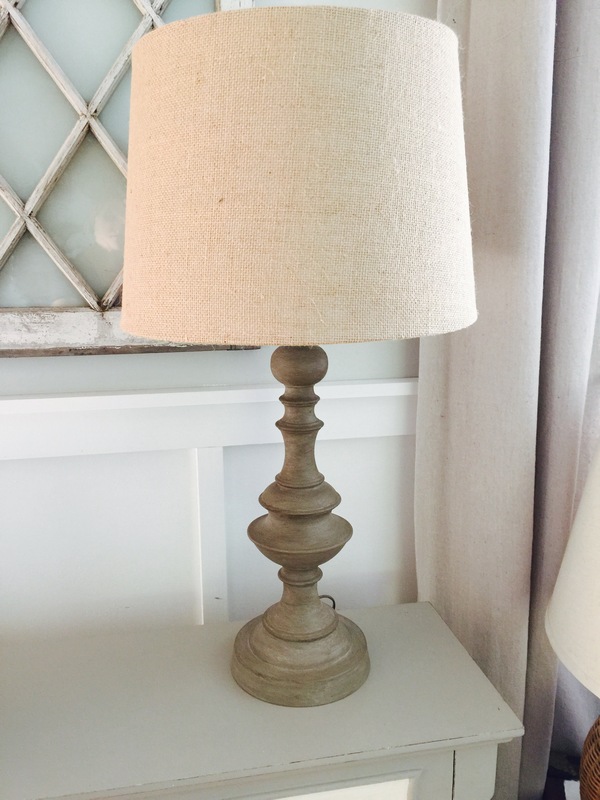 It’s amazing what a bit of paint and some wax can do to outdated lamps! I love how the wax clings to the grooves of the brush strokes. 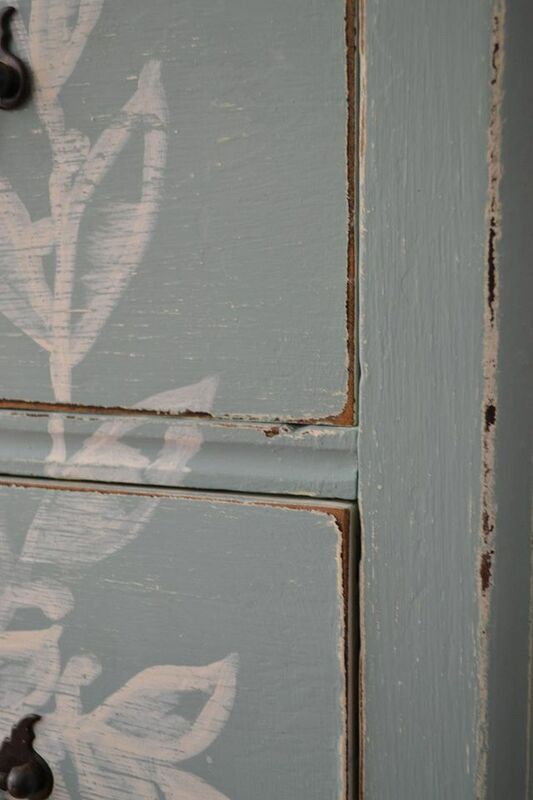 It really adds to the weathered, patina look I was after. 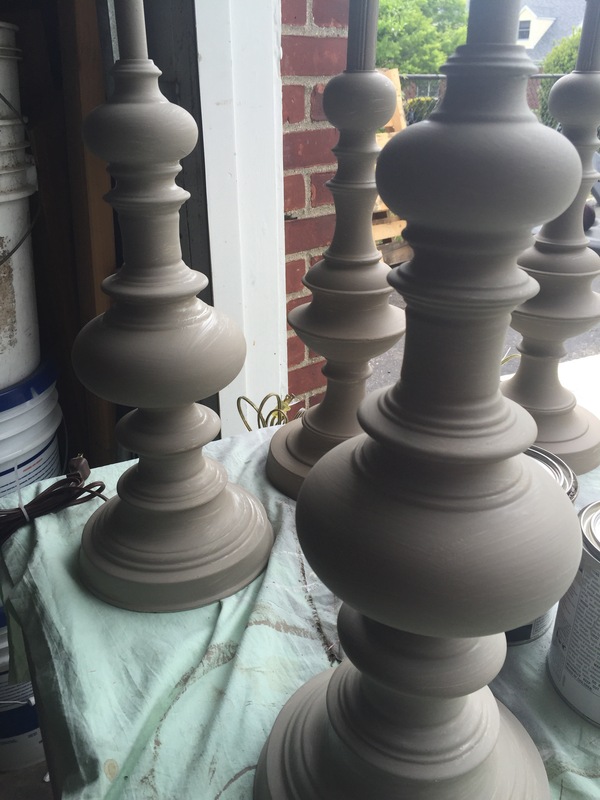 Needless to say, my client was thrilled with her lamps! Try this technique out on your lamps and other accessories! I’d love to see your transformations!